I was sitting in my office, browsing tech news online almost a decade ago when I first saw the mini-ITX form factor. My mind immediately started fantasizing about the possibilities such a small system would afford. 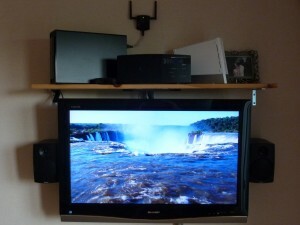 Thoughts of internet terminals built into kitchen cupboards or car PCs entertained my imagination for years. As the early VIA-based systems got into reviewers’ hands and performance results started hitting the press, like many others, I was left wanting. A PC that struggles to play flash-based videos, or 720p video content doesn’t get me very excited. The first system that really caught my attention hit the scene in 2006, the Albatron KI51PV-754. 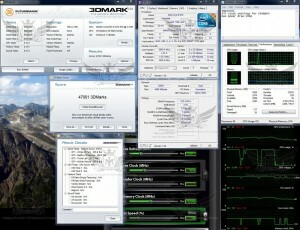 It was based on socket 754 for AMD Athlon 64 processors. But, since the socket didn’t support dual core CPUs like the 939 socket did, you’d be stuck with a single core CPU, and a single DIMM of memory, it also lacked a PCIe slot and the price was unreal! So, it was encouraging to see progress, but obviously the platform was not ready prime time. Albatron kept at it and in the summer of 2007 released a system based around the new AM2 socket, the KI690-AM2, which would accept Athlon dual core CPUs. 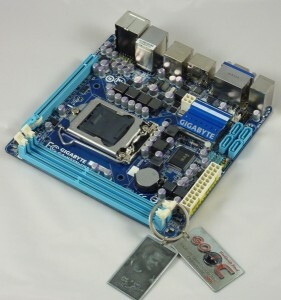 But like it’s predecessor, it also came with a few flaws, it was stuck using SO-DIMMS for memory duty, was still lacking a PCIe port for the GPU, and the cost was still too high. 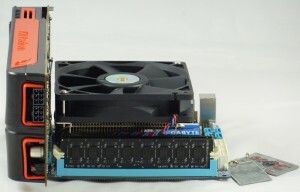 Then in 2008, nVidia debuted their new ION system, which it was said would answer everyone’s payers concerning performance per watt. Combining the low power consumption of the modest Intel Atom CPU and a small integrated GPU by nVidia, the ION would have the combination of CPU and GPU power to be taken seriously, at least once everyone was on board. It’s taken some time to get everyone on board, but this ION system is proving to be very versatile these days. 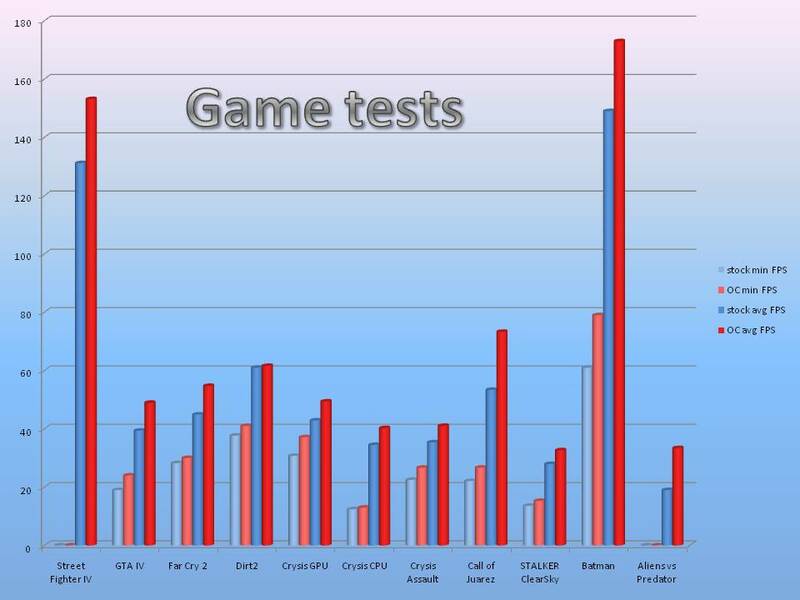 There is one area where it still does not make the grade…gaming. 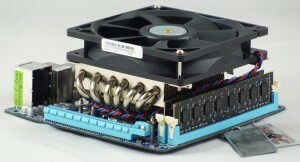 Then, another small company hit the scene in 2008, they had been selling nVidia-based graphics cards for a couple years, and decided to try their hand in the motherboard market. 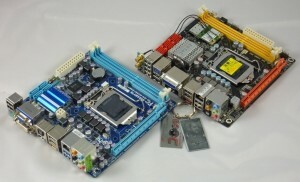 In late 2008, Zotac released a rash of AMD and Intel based mini-ITX motherboards that were clearly aimed at enthusiasts. 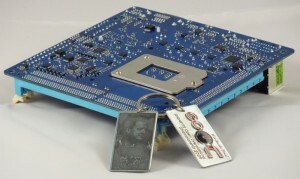 The boards were based on all of the latest chip-sets including ION, nVidia 6100 series for Intel, nVidia 8200 series for AMD based systems. 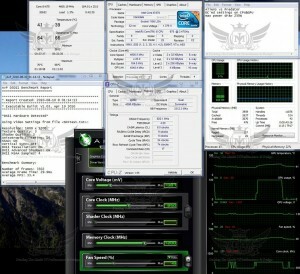 And then in early 2009, the nVidia GeForce 9300 series for Intel-based systems. 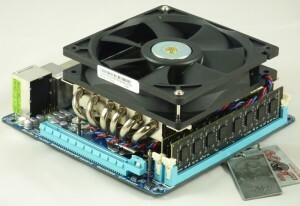 Obviously there have been many other mini-ITX products that have been made. I don’t mean to play down any of the other products, but from my perspective, these were the milestone products. 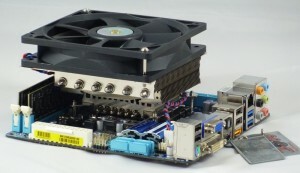 The ZOTAC GF9300-G-E was my first mini-ITX motherboard. 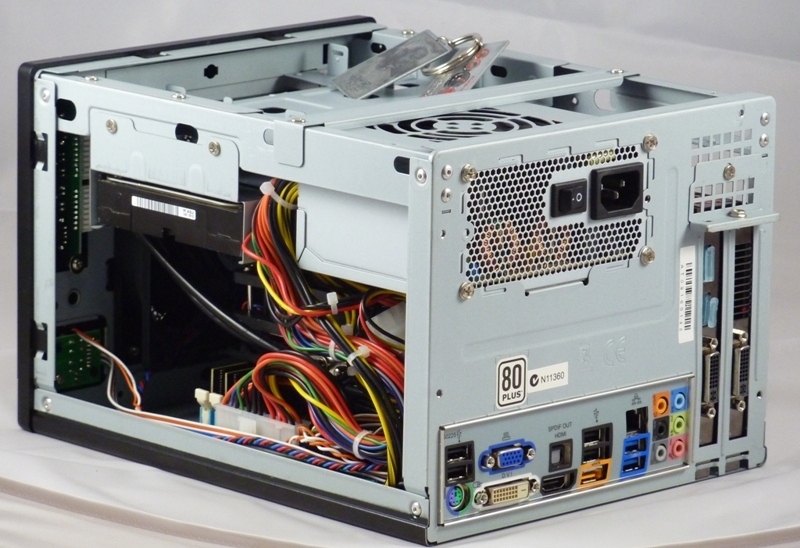 It had all the features one could ask for at the time, socket 775 for a powerful Core 2 Duo CPU, dual channel DDR2 support for regular sized DIMMS, a PCIe x16 slot for dedicated graphics, and even onboard WI-FI! 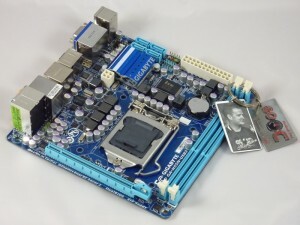 I brought the board home, and went straight to work rebuilding my HTPC around it with an E8400 Core 2 Duo at its heart. It didn’t take long for me to figure out that the system still had a fatal weakness…power consumption. I had built the system in an Antec ISK-300-65 case. 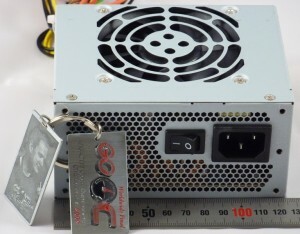 But that “65” at the end of the model number is significant, it represents the wattage supplied by the case’s PSU. 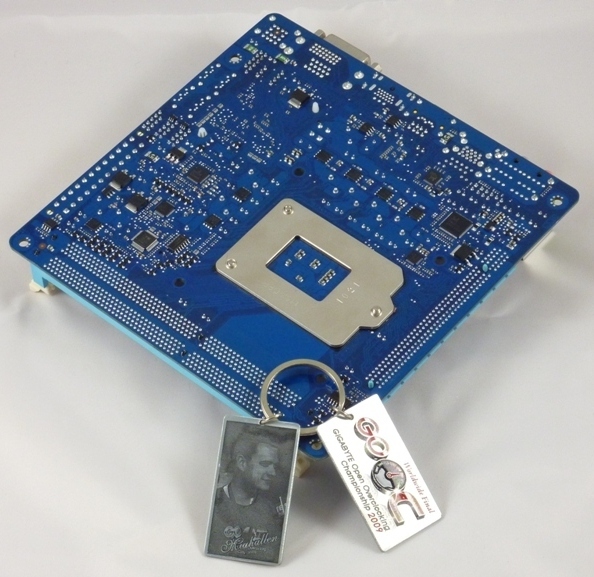 65W proved insufficient to power the system, even when underclocked, and undervolted. So, when it was working I was very happy with the performance, but it really wasn’t very well suited for a really small system. Then at CES this year, Zotac announced plans to release a new mini-ITX board based around the LGA1156 socket for Intel Core i3/i5/i7 CPUs. I was drooling on my keyboard when images first hit the net. Was this going to be the answer to our questions, on paper it was just about perfect. 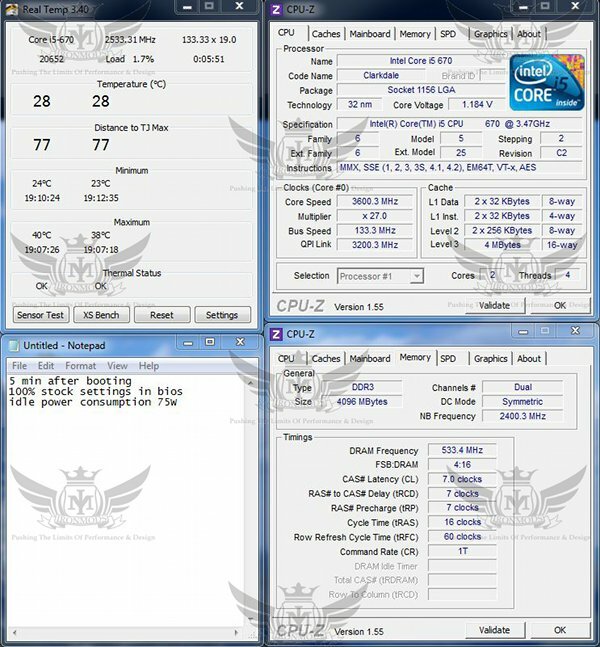 Quad core support? Check. Dual channel DDR3 with regular sized DIMMs? Check. PCIe slot? Check. Onboard wi-fi N? Check! So, as soon as they were released, I had two on their way to me. This is not a review of the Zotac board though, the H55ITX served me for about four months in my HTPC, and while it never impressed me, it worked in the Antec HTPC case I had, and 65W seemed plenty. The system was stable, and my HTPC was working well for the first time in years. I finally got around to putting the second board into a SFF gaming PC about six weeks ago. This machine I built with the intention of overclocking…whoops! Things went sour shortly after first power up. I’ll go into really brief detail. Actually, the very first time I booted the first board, I thought it quite odd that there was a message at the bottom of the post screen stating “FOR EVALUATION PURPOSES ONLY”. I thought it was just a fluke. But after powering on the second board for the first time (a few months later), I was greeted with the exact same message. Once into Windows, I opened CPU-Z and on the motherboard tab, all of the vendor specific fields show “to be filled in by O.E.M.”…hmm. A quick check on their support page shows the very first BIOS update removes the post screen message, and that’s it. I think it’s a bit sloppy that Zotac would ship out their boards to distributors with a pre-release BIOS, but apparently, that’s exactly what happened. So, I updated the BIOS of both boards with the latest version at the time, version 330. And the message at the post screen did in fact go away. However, the fields were still not completed in CPU-Z. So, I’m more concerned with performance and I was willing to forgive all else if high performance was present, but it wasn’t. My original goal was to build this gaming rig with a Clarkdale-based dual core CPU overclocked to at least 4.5GHz. I had two Clarkdale CPUs which I had purchased for my extreme overclocking endeavors. My i3 540 ended up in the HTPC system, the other CPU I had on hand was my very strong i5 670; yes, the same one that I took to 6.8GHz a few months ago. 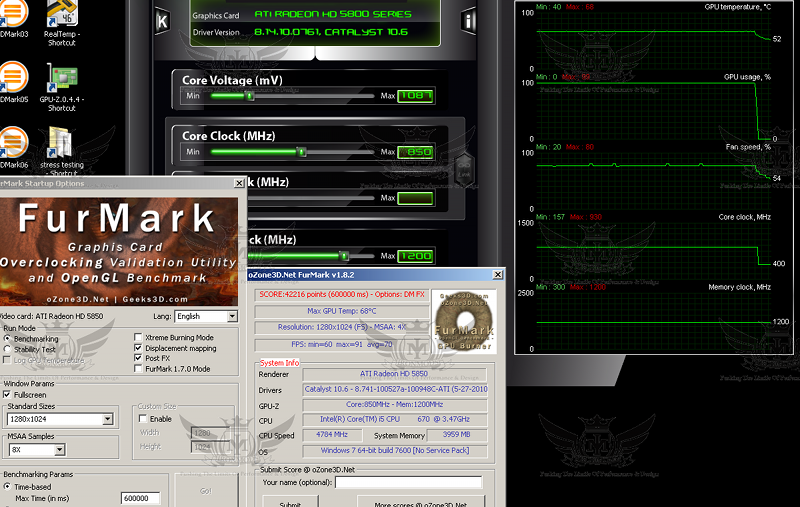 Seemed like a good candidate, so I set right off to try to overclock it to my target, but I fell well short on my goal. There is no way to increase VTT/QPI voltage in the BIOS, so I was limited to around 154MHz bclock, with a maximum CPU multiplier of x27, that put my CPU clock at only 4150MHz. Not bad, but I knew I could do better, but without the option to increase the VTT voltage, I was stuck. The second major problem came a short time later. I had ordered some low-end GeIL DDR3-1333 DIMMs, and when they arrived, I popped them in. For the next two weeks I struggled to get the system stable and I was not successful. Although the memory would pass memtest with flying colors, the system remained completely unstable with regular BSOD’s in Windows. It took me quite a while to determine it was a compatibility issue with the memory, because it would pass memtest as I mentioned. After switching to some extra OCZ Gold DIMMs I had, the instability and BSOD’s went away. Around this time, Intel released their new Core i5 655K CPU with and unlocked CPU multiplier. I thought this would be the perfect solution for my Bclock issues. 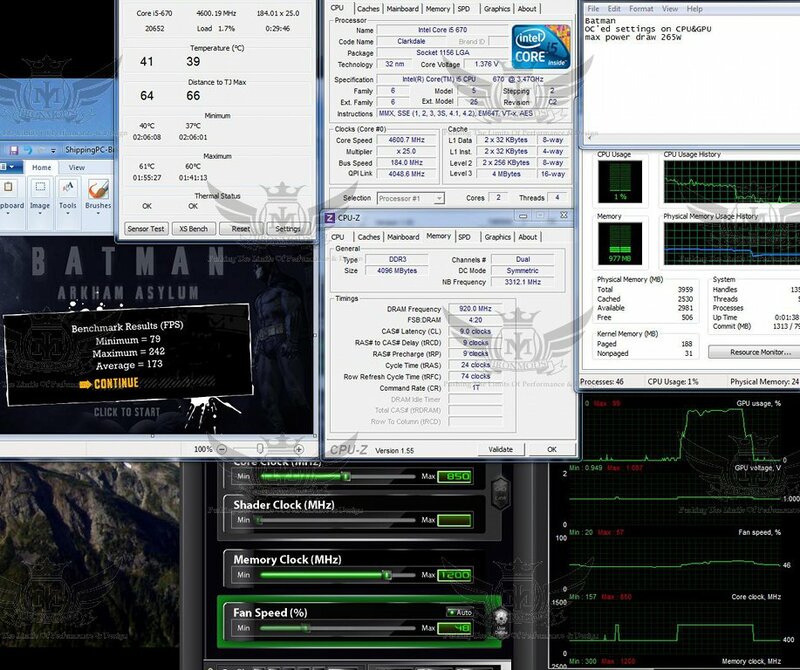 If I didn’t have to raise the bclock, I should be able to reach my goal by simply raising the multiplier and CPU voltage as necessary, as long as the CPU was up for those speeds. 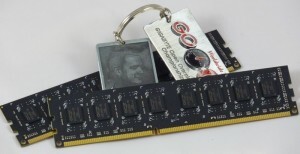 But after purchasing the new CPU and installing it into the board, I quickly realized my problems were not over. Right off the bat, the board was feeding my brand new CPU 1.4V with all stock settings loaded. And undervolting back to normal levels resulted in instability. In addition, the “unlocked” multiplier didn’t work! I’d seen many people with this issue, so I went through methodically, manipulating every setting in the BIOS trying to figure out how to get the extra multipliers to work. After a couple days of searching support forums and asking for help, I decided to e-mail tech support. After about a week, I heard back from the USA branch with contact info for the BIOS techs in Hong Kong. So I sent my request for help to them, and waited, and waited, and about a week later I got an e-mail for one of the techs claiming they would try to provide a beta BIOS to fix the issues. And about a week later he sent me the beta BIOS and IT DIDN’T CHANGE ANYTHING! I wrote back and to report my findings, and over the next few days the BIOS engineer and I exchanged several e-mails in an attempt to correct the problems. The culmination of these efforts ended with zero changes to the problems, and the engineer claiming that it worked fine for him. 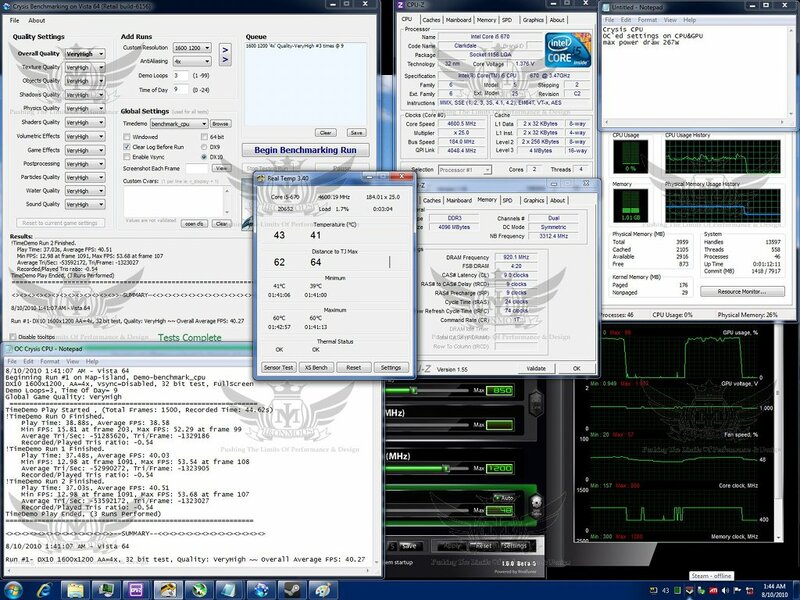 The only theory I have is that he was using an engineering sample, and my CPU was a retail sample. About the same time I started building the gaming box, Gigabyte announced plans to produce their first ever mini-ITX motherboard. At first I wasn’t interested, because the onboard wi-fi on the Zotac was a slightly important feature for me. 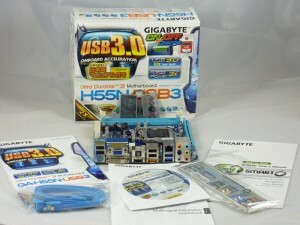 However, after working with the Zotac tech support and failing to resolve my issues, I decided it was time to move on to a motherboard manufacturer I could trust, enter the Gigabyte H55N-USB3. 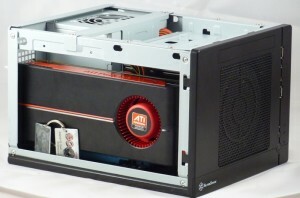 As the very first product in the mini-ITX market from Gigabyte, you’d expect a few shortcomings, here and there. 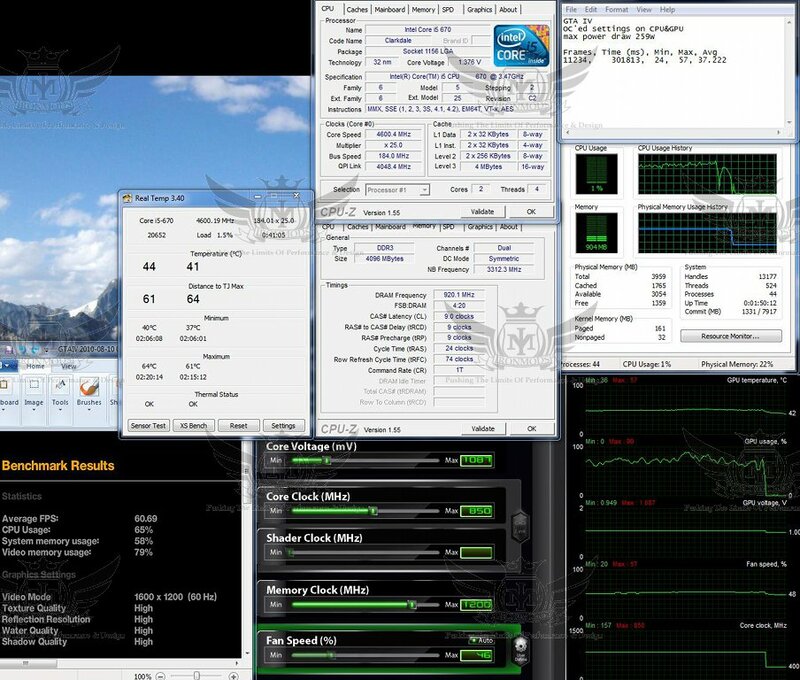 You might expect an immature BIOS, limited overclocking, or buggy drivers and/or features. However, I’m very happy to report that you’d be dead wrong! In case you’ve been living under a rock, I happen to be very familiar with Gigabyte motherboards, I’ve played with quite a few over the last year or two. It would take me a few minutes to distinguish between the BIOS on this board and that of the P55A-UD7. This board is built just like its bigger siblings, it’s amazing! We’ve come to expect lower-end motherboards to have a lower-end BIOS. But that’s just not the case anymore with Gigabyte! And sure, you lose the onboard wi-fi to the Zotac board, but you gain SATA3 and USB3.0, which is great for future expansion and compatibility. Here you can see the two boards side by side. Very similar in layout and design. But you’ll notice the Zotac’s onboard wi-fi module, and six (instead of only four) SATA ports. Also, on the back panel, Zotac provides ten (wow) USB2.0 ports to Gigabyte’s four USB2.0 & two USB3.0 ports. So, feature wise, I’m still a fan of the Zotac board. 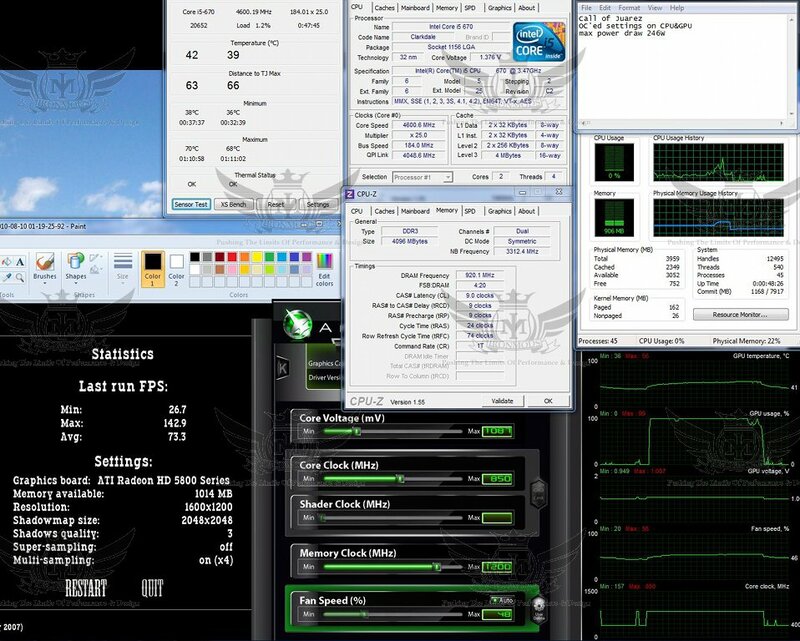 But the real game changer is overclocking performance. So, what components did I use? How exactly did I put this system together? 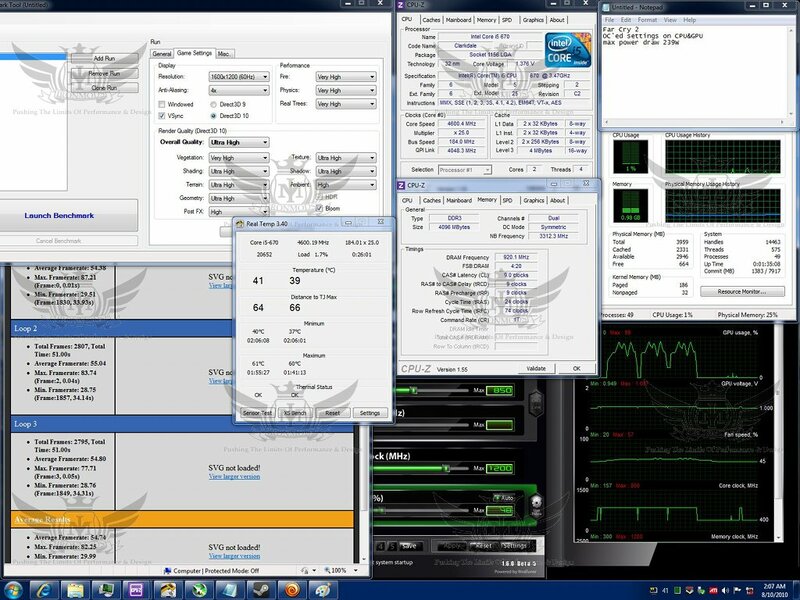 How high was I able to overclock it? How well does it perform? How much power does it consume? What components did I use? Case – Silverstone SG05 The case may be the single more vital aspect of a SFF build. 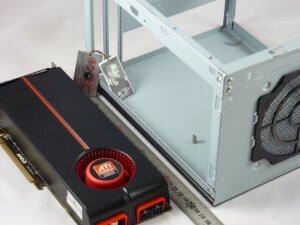 The who point of a SFF build is to be small; the case you choose will determine the precise amount of “small” that you get. 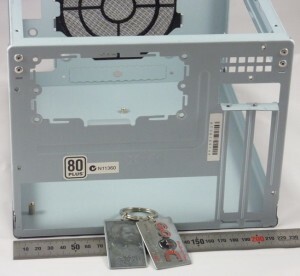 To my knowledge, the Silverstone SG05 is the smallest case on the market which will support a 9.5 inch long, dual slot graphics card. Actually, I’m still a bit shocked by just how small this thing is: my main PC is in a Coolermaster Cosmos S case which is almost 6100 cubic inches, the SG05 is only 658, barely more that 1/10th the size! 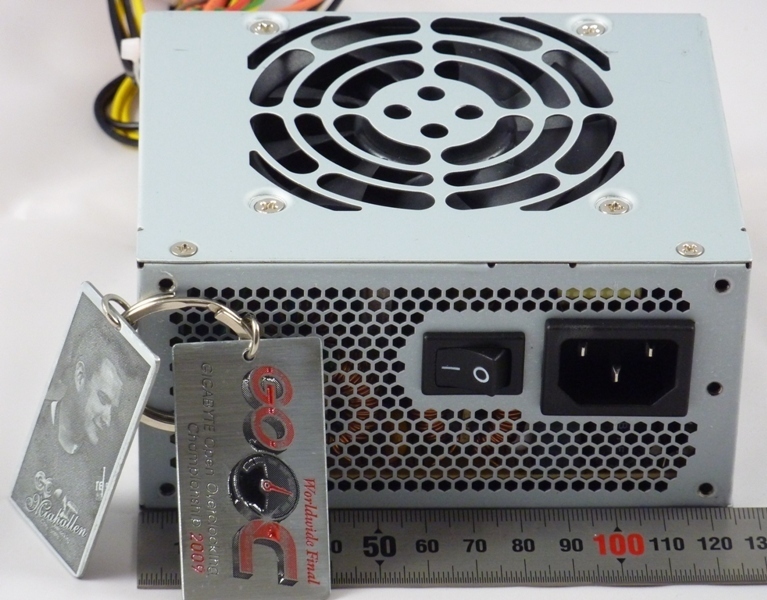 It has one other very important feature for a gaming system, a powerful 300W PSU, which is 80+ certified made by FSP. Motherboard – Gigabyte GA-H55N-USB3 As seen above, a very well-endowed mini-ITX motherboard. CPU – Intel Core i5 670 I tested both this and the i5 655K extensively, and this CPU proved to be a vastly more capable overclocker. 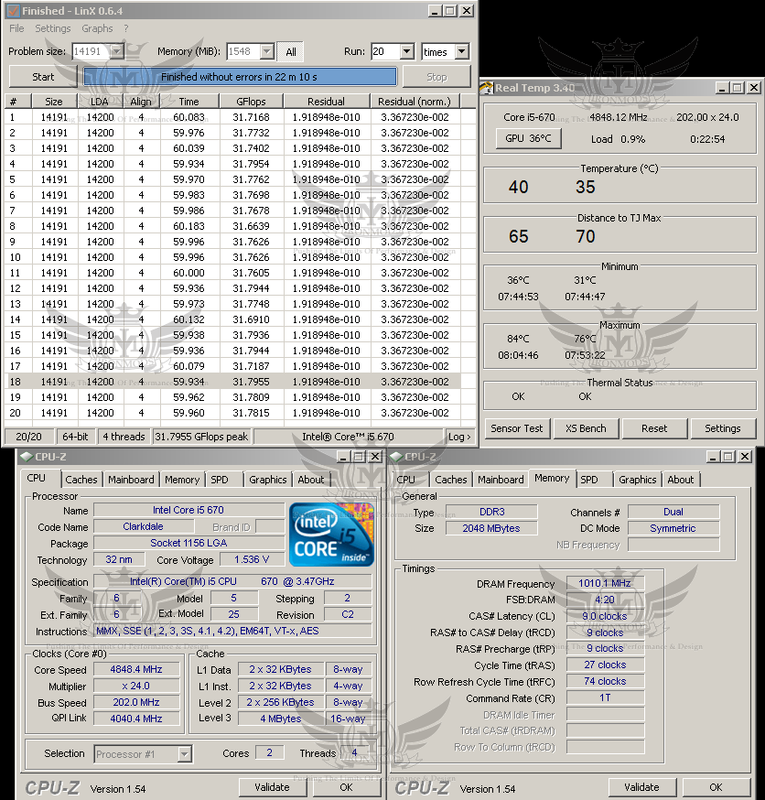 A better choice for most users would probably be an i3 540 which have been shown to be very capable overclockers for a much more sensible price. Another worthy candidate for a build like this would be a Lynnfield-based quad core i5 or i7 CPU, although it will put a greater strain on the PWM on this motherboard, and a greater draw on the PSU. 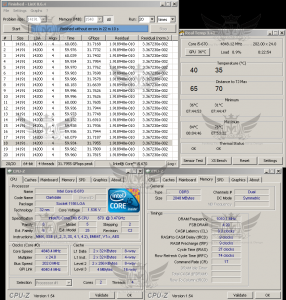 CPU cooling – Intel Core stock HSF, and the Prolimatech Samuel 17. There are a couple other good choices on the market. 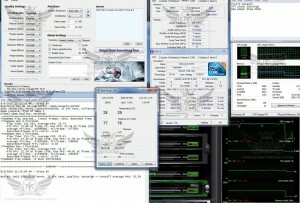 But I choose the Prolimatech due to my highly positive experience with their tower cooler, the Megahalems. 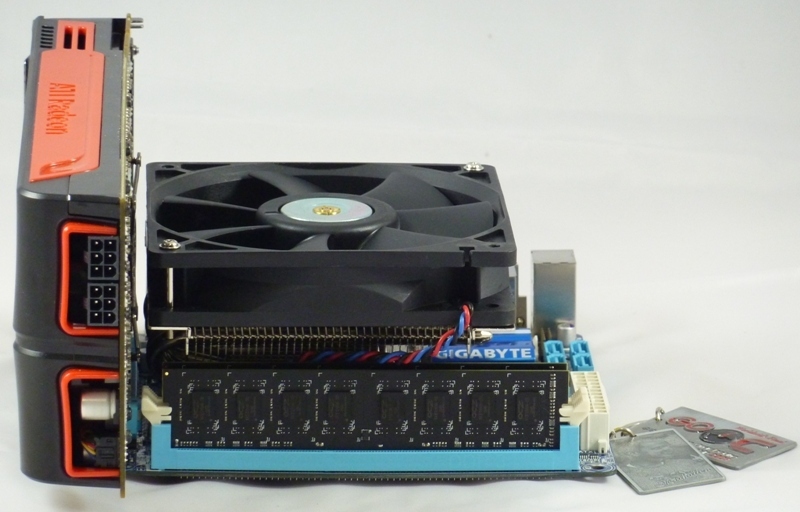 Video card – VisionTek Radeon HD 5850 1GB This is a reference design 5850, so brand is not important here; all boards based on the reference design are only separated by their BIOS. This GPU represents a very good value, it has near top end performance for a reasonable price. It has a very high performance-per-watt factor, and it fits! The other very sensible choice from the green team would be the new nVidia based GTX 460 GPU. However, I wanted maximum performance, and the 460 doesn’t quite match up to the 5850. Storage – Intel X25-M 80GB SSD and 1TB Western Digital Caviar Green I had the SSD sitting around after upgrading to a G2 drive in my main office PC, it’s being used for Windows 7 x64 only. The 1TB drive is used to store all of my games and media files. I’m not using an optical drive in this build, as all of my games are digitally downloaded from Steam. 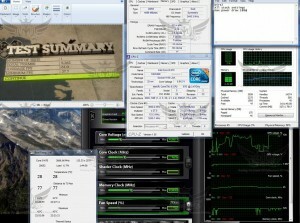 If you are on a tighter budget, you could forgo the SSD and still have stellar performance. 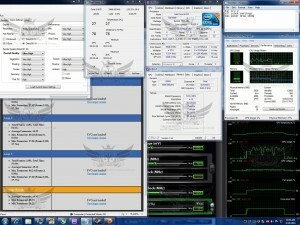 Monitor – Dell UltraSharp 2007FP All testing (except 3DMark tests) will be performed at the native 1600×1200 resolution. I’d like to talk about price for just a moment. Systems “designed for gaming” do not always live up to their hype, especially for one on a budget. The reason for this is the graphics card. There are a ton of online PC vendors around, and many of them will build you a “gaming system”. They’ll use a high end Core i7 CPU, triple channel memory, and a bunch of other cool stuff that sounds great on paper, but then they put a low end graphics card into the mix (to save on costs), and it just ruins the whole thing from the perspective of gaming. The system I build here would cost about $1300 (not including the monitor), although following my advice an purchasing a Core i3 540, and forgoing the SSD could cut the cost down to well under $1000. 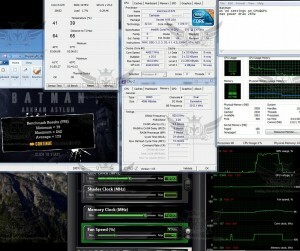 Yet you’d be hard pressed to find a machine as capable for gaming from one of the previously mentioned online vendors. Please heed this advice, if you want to build a gaming system, start with the graphics card, and go from there. How exactly did I put this system together? 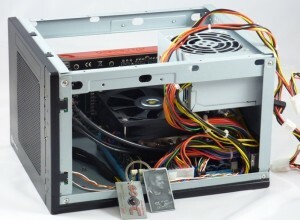 First, I stripped the case down to the basics to ensure all the components had clearance, to ensure all the PSU connectors were long enough, and to form a basic game plan of how to organize everything to go in it properly. This is not an exact science, and it took many attempts to get everything situated and happy. You’ll also notice I modified the PCIe power connector by soldering on a splitter at the end, giving me the dual connectors required by the 5850. 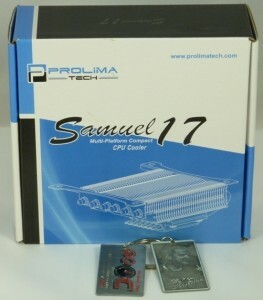 Then, I unpacked and prepped the Prolimatech Samuel 17 heatsink. This thing is a very impressive looking cooler to me….totally means business considering its size. Then, I assembled the motherboard, CPU, CPU cooler, and memory outside the case. Here you can see one of the delta fans I’m using for cooling, very powerful and fairly loud. Then, I did a quick test fit of the graphics card to give you an idea of the clearance. Next, I mounted the motherboard assembly into the case. This next part was the trickiest. I now had to wedge the graphics card into place. It looks as if it’d fit with room to spare. However, with the reference 5850 design, the PCIe 6-pin power connectors are on the end of the graphics card, and it was impossible for me to plug them in after mounting the card. So I had to get the card into the case with the power hooked up. 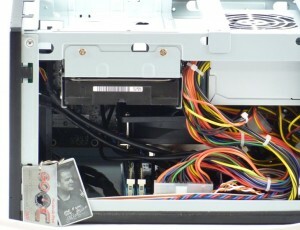 But if the PSU was installed first there wasn’t enough room to get the card in. 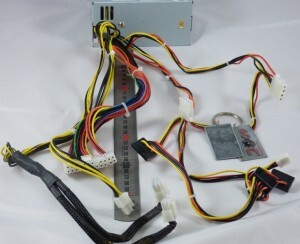 So I had to have the power connected from the PSU to the card, and both outside the case. The other thing in the way was the fan mounted on top of the Samuel 17 cooler, it had to be removed prior to getting the graphics card in. Then I reinstalled the fan, and finally the PSU. 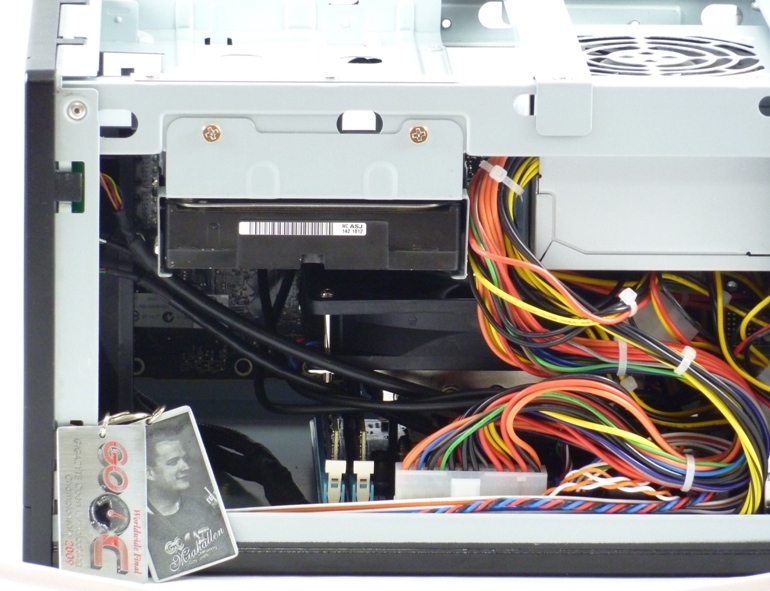 I also reversed the PSU; normally, the fan faces down and draws air out of the case. But as one of my major concerns is the PSU, I turned it around to allow it to draw cool air in through the vents in the top of the case. After getting the graphics card and PSU installed I installed the second Delta as a front intake fan, and the front panel. The last step was to install the storage bays. Obviously, I’m not overly concerned with appearances (ie wire management) with this build. For me, it’s all about the performance! So, there you have it…small enough to be easily portable. 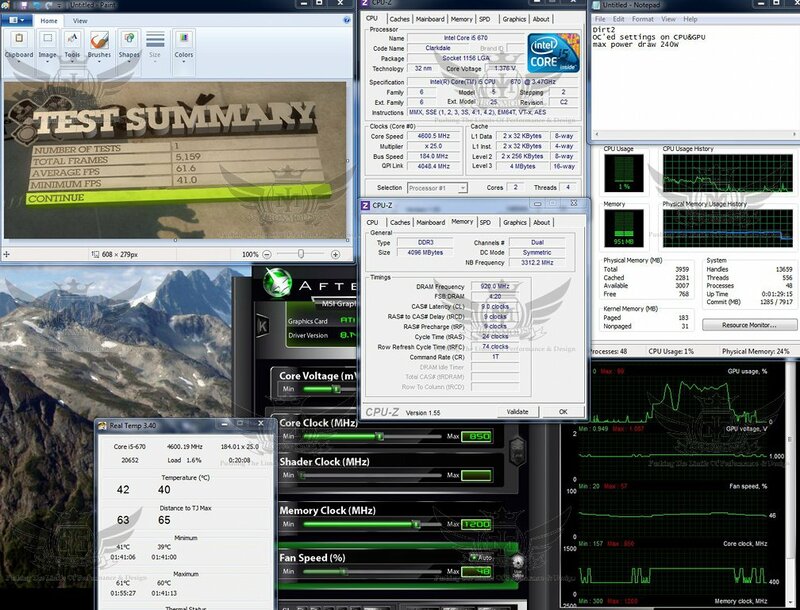 How high was I able to overclock it? 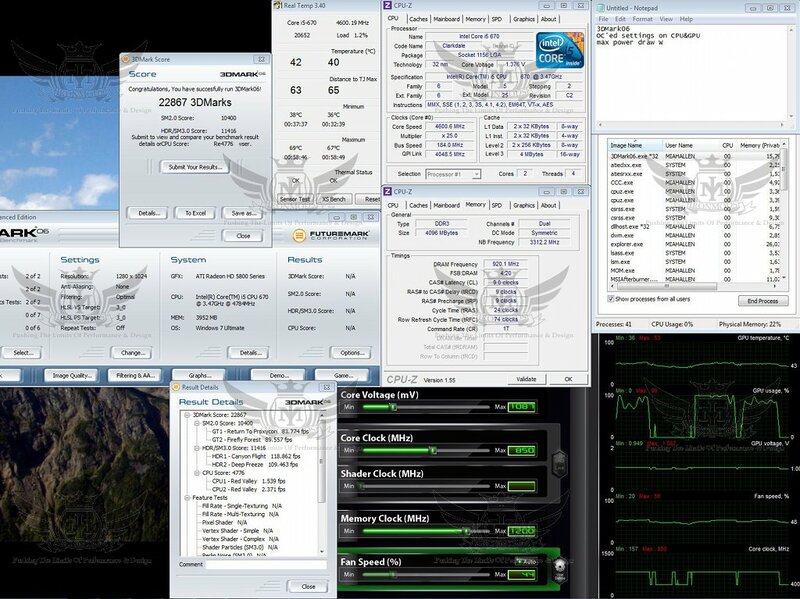 Overclocking can be intimidating to first timers, but as long as you take it step by step, and approach it methodically, it’s not nearly as difficult as it may seem. 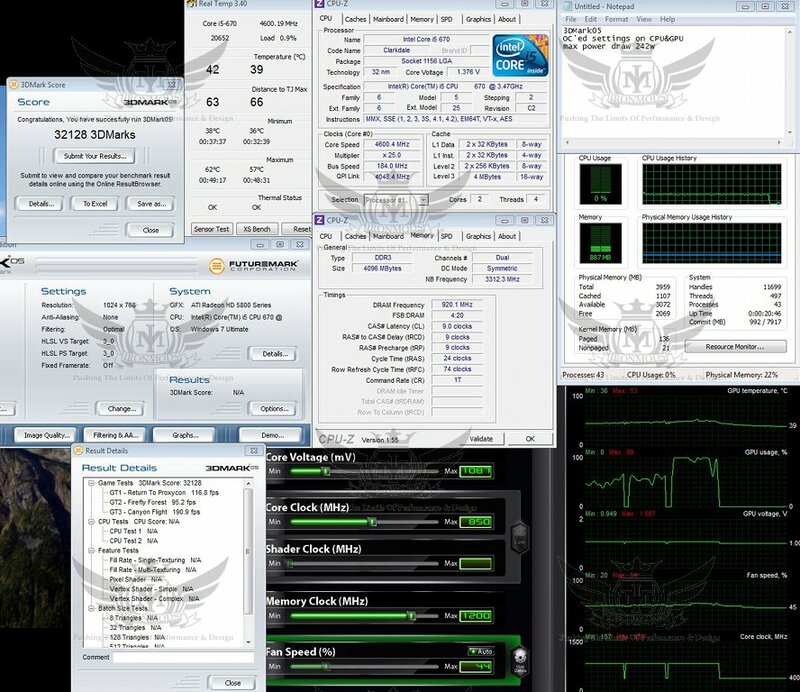 I wrote a 3 Step Guide for overclocking your i3/i5/i7 CPU, be sure to give it a read if your attempting an OC for the first time. 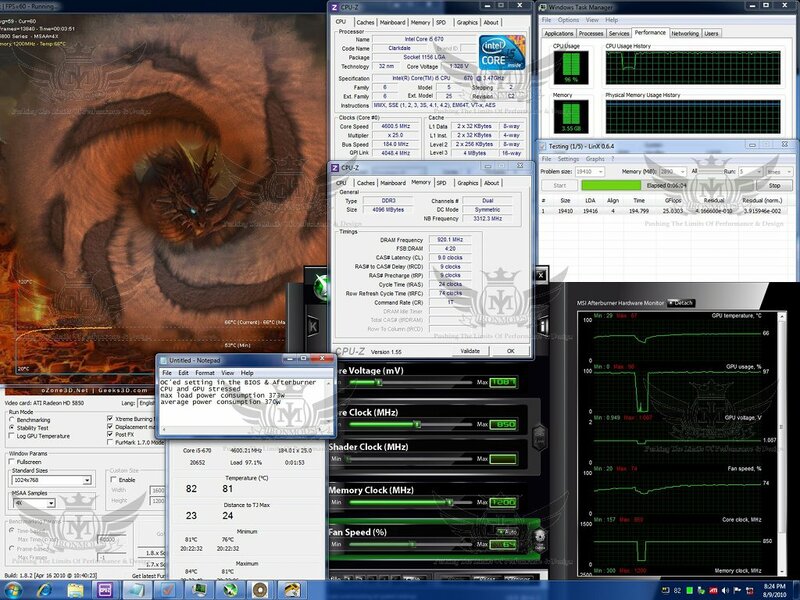 I started by testing the overclocking potential of my CPU with my custom water cooling loop. 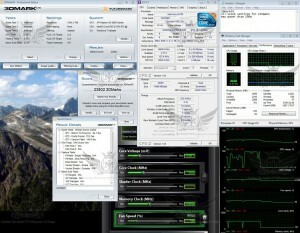 I found that this i5 670 CPU is a very strong chip. 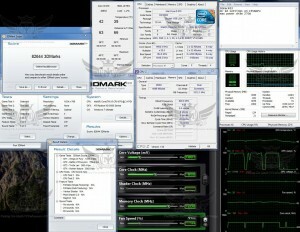 4.5GHz was much easier than expected, and 4.6GHz also fell with ease. After a few hours of playing and tweaking I was able to get a maximum frequency of 4848MHz stable for 20 passes of LinX. Obviously I wasn’t going to be able to run that high with the Samuel 17 cooler but I still find it valuable to find the capabilities with a little more cooling. I had too many Intel box coolers sitting around recently and threw out the non-copper-core versions. So this one has a copper core like the one that would come with a top end i7 870. I don’t overclock with stock Intel coolers very often and this exercise reminded me why….they’re terrible! I was unable to give the CPU any more than about 1.2V or it would go into the temperature danger zone. For me, that means above 95°C when running LinX. 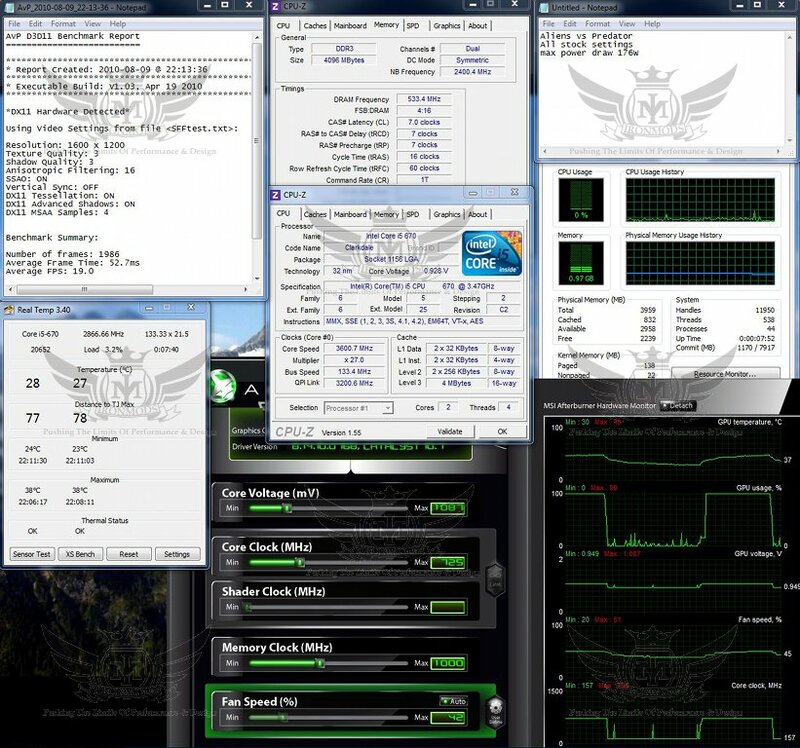 Now keep in mind my ambient temps were very high, about 31°C during this testing. 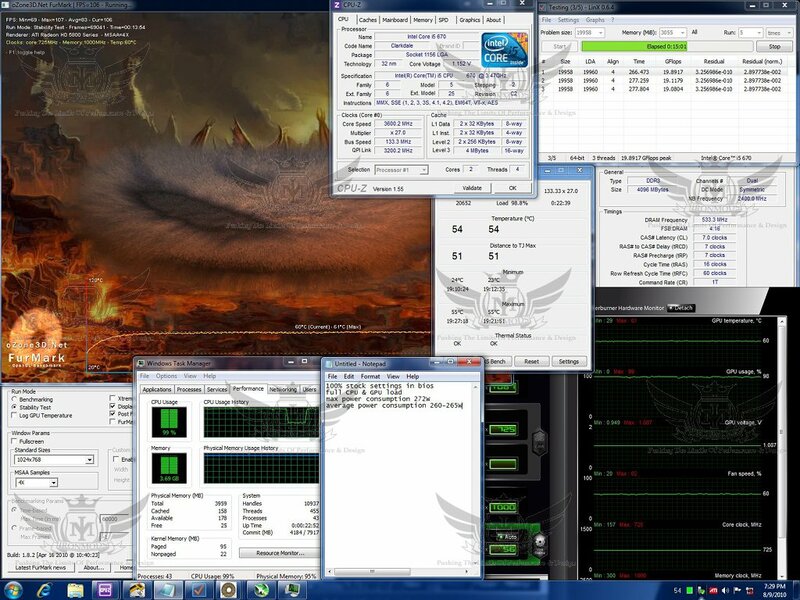 On the left, my maximum OC with the Intel cooler, 4140MHz with 1.2V and getting pretty hot! 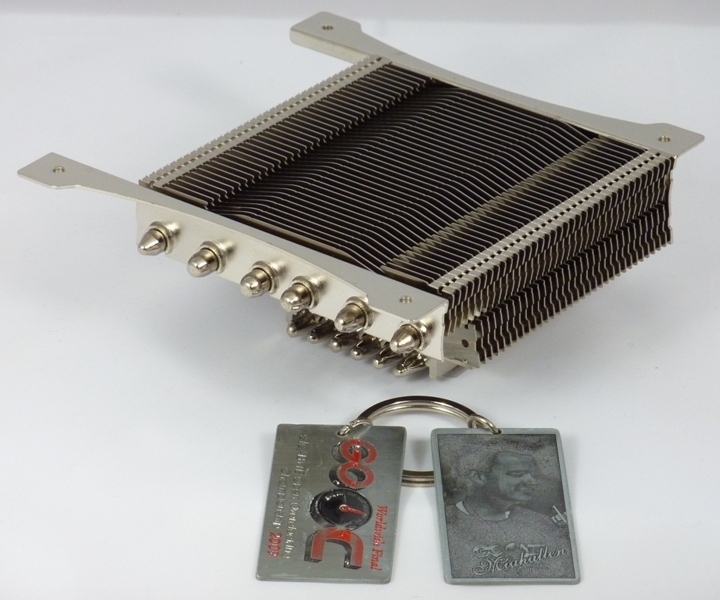 On the right, the Prolimatech performs the exact same test with the exact same test conditions… but keeps the chip 26 degrees cooler! 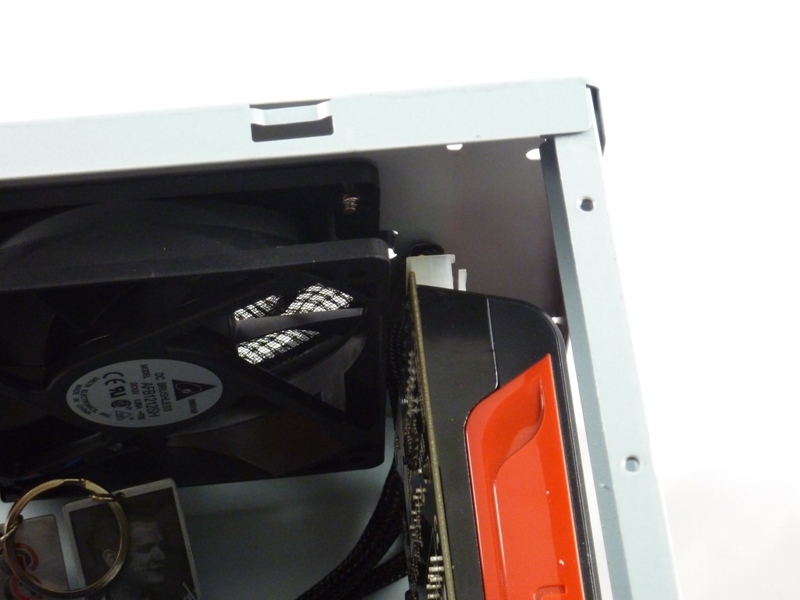 Nice… silentpcreview also recently reviewed this cooler and came away impressed, but they also compared it to the Scythe Big Shuriken, which when equipped with the same fan was able to outperform the Prolimatech cooler. So be sure to consider that one as well. 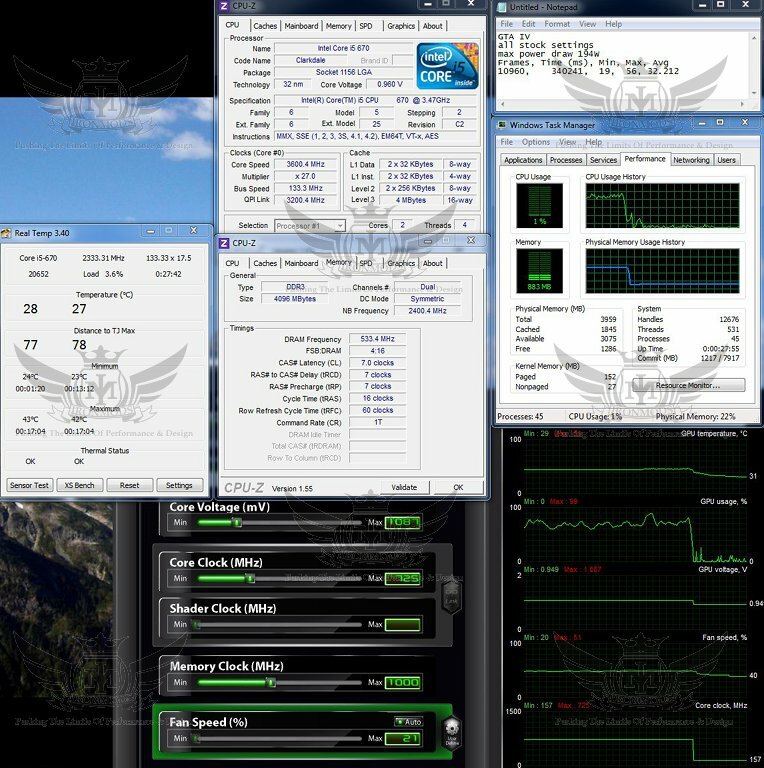 Next, I went to work pushing the CPU back up to the limit of the Samuel 17….I ended up with a very respectable 4.6GHz with 1.35V. I also spent a little time overclocking the 5850 graphics card. 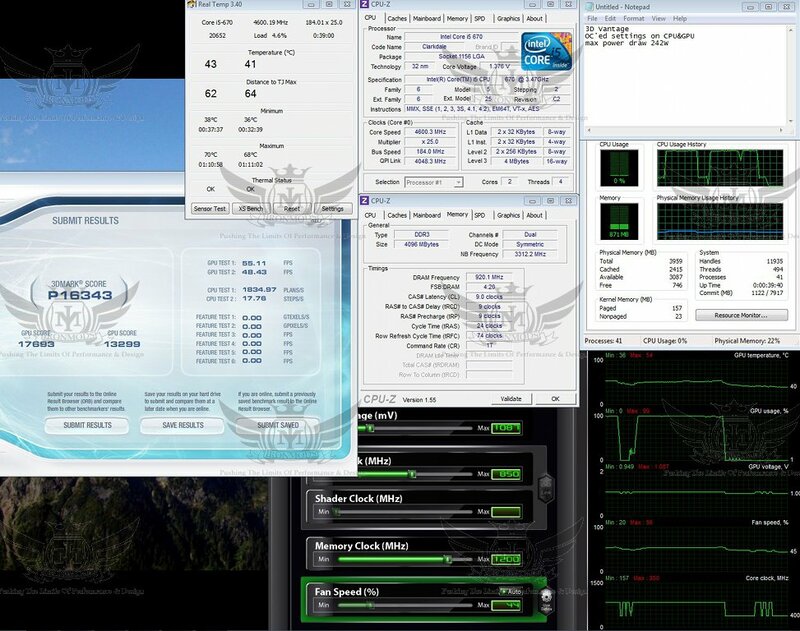 With stock voltage I was able to increase the GPU clock from 725MHz stock to 850MHz, and the 1GB of GDDR5 memory from 1GHz stock to 1200MHz (4800MHz effective). I was pretty impressed with that overclock on stock voltage. 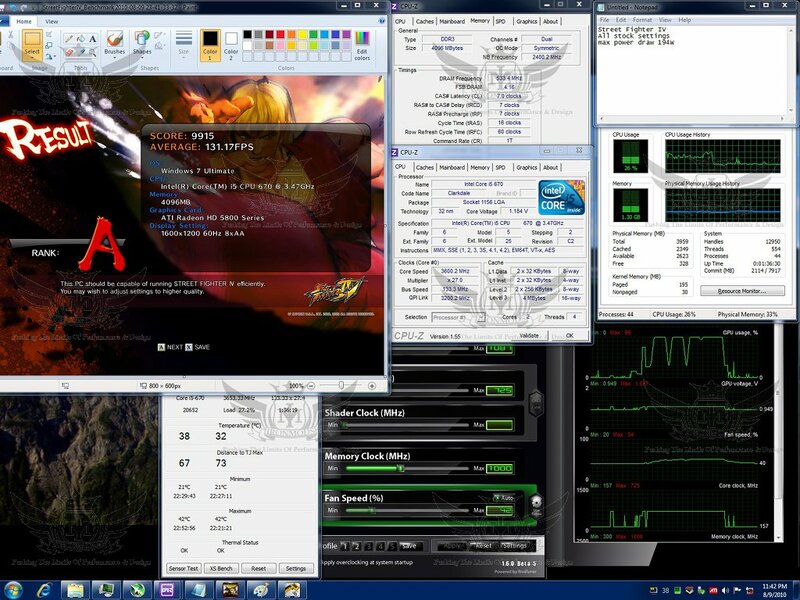 I spent a bit of time pushing the GPU core further with the help of some additional voltage. But considering power consumption, my performance-per-watt diminished very quickly as I raised the voltage. So I decided to stay with the 850/1200 I had already established. These will be my 24/7 clock speeds. 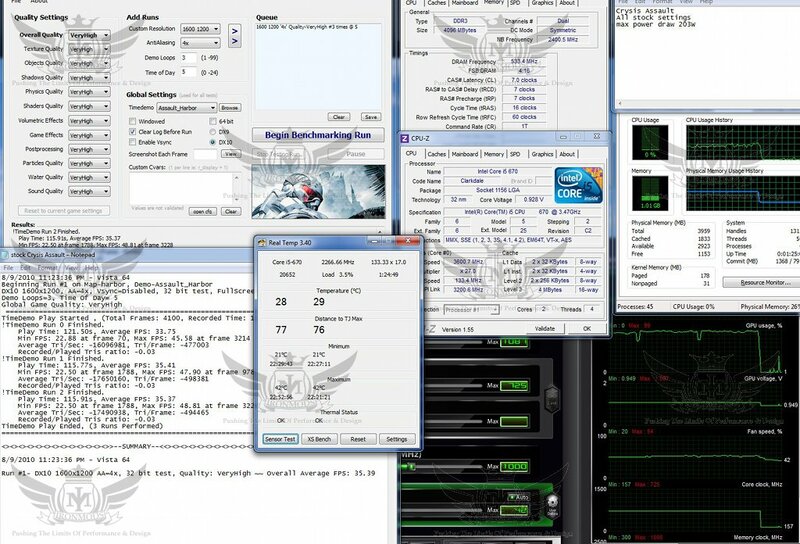 Well, this is where I run a bunch of tests to see what kind of performance a system like this can provide. 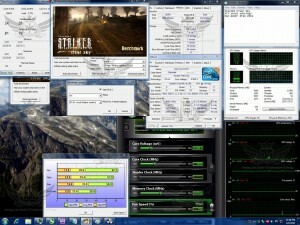 I’ve run all the tests twice to compare the stock speeds with the benefits of overclocking. 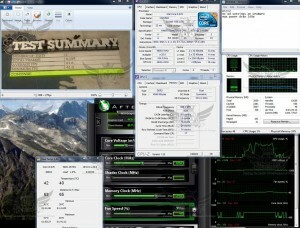 So, on the left are the results with the system at stock speeds, and on the right….overclocked. 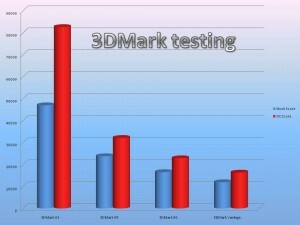 I started with the four Futuremark synthetic gaming benches and then moved on to 8 real world gaming tests. Here are the results all summed up. I’ve also included the screen shots for each run at the bottom of the article. Futuremark testing is my speciality but not the point of this article and have pretty limited relation to real world testing. However, it is nice to see some significant gains can be had from overclocking. 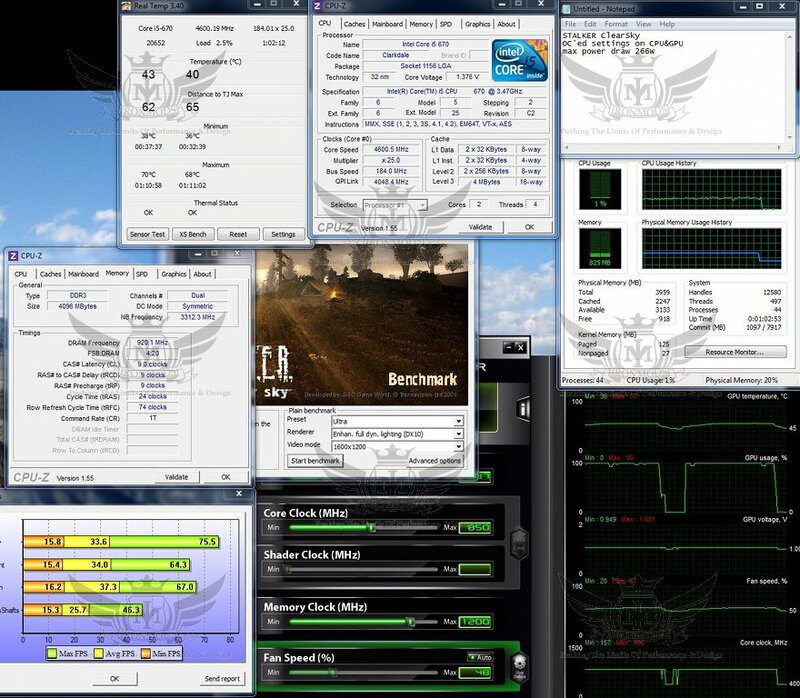 If you’re interested in pushing your overclocks to the max for this sort of thing, please check out the “Benchmark Buffet!” which will help you understand the basics of competitive benchmarking. 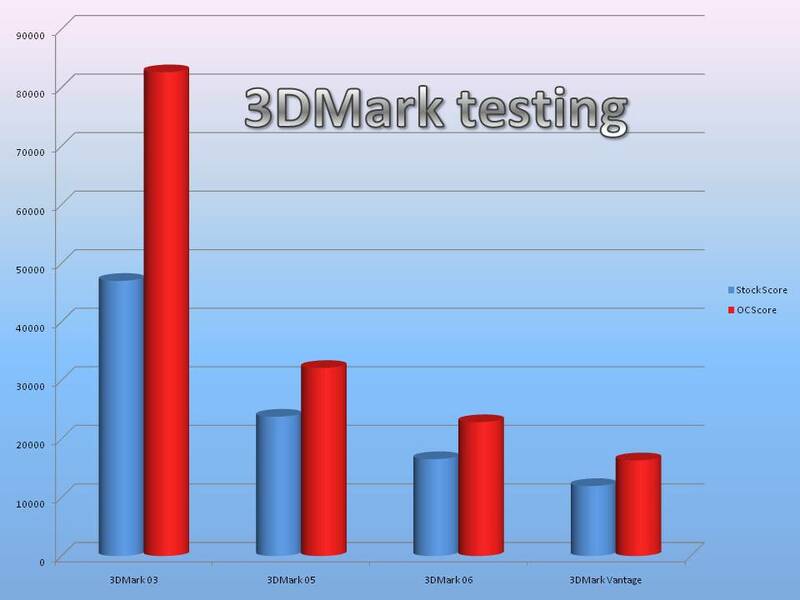 As you can see most of the tests scaled very well with my OC’ed settings. All of the games were into comfortable frame rates with the system OC’ed although there were a couple that were just barely there. Crysis, as we all know is a beast of a game. I’ve played through the entire original game again and Warhead (for the first time) with this system, with maxed settings and AA x4….and for the most part my frame rates stayed in the 30s and 40s. Very comfortable in my opinion. There are certain action situations where frame rates can drop but they are rare. Overall, I was very impressed with the performance. To be able to play this title on a box too small for my shoes, that cost less than $1300 is fantastic! Another title that was struggling is STALKER. This game is a beast as well and shows nice improvements with multiple cores. It’d probably have a nice boost from a quad core CPU in this situation although there probably are areas where it is GPU limited as well. 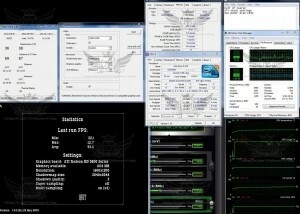 I’ve been playing the game with this system and it’s not perfect with the settings maxed. For better gameplay I’ve disabled the DX10.1 features and it plays nicely. 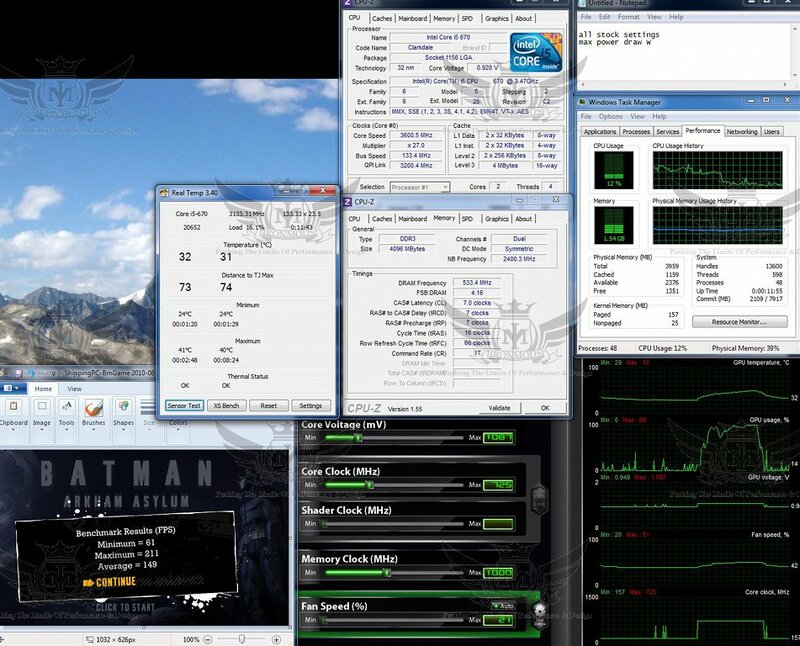 The last game I’d mention is Grand Theft Auto IV which really needs a fast multi core CPU for best performance. 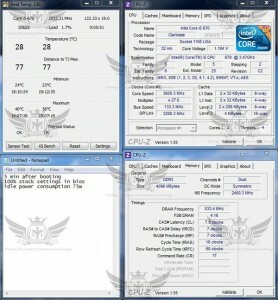 This title is definitely CPU limited on this system and could really benefit from a quad core. You can see in the screen shot that it makes best use of the CPU power available in comparison to all the other titles here sitting at an average of about 75% CPU utilization. Despite this, my settings are maxed, and gameplay only slows down to bothersome rates when it’s dark and foggy, and I’m driving around with my headlights on….in these situations police chases can be difficult as FPS drop into the low 20s. 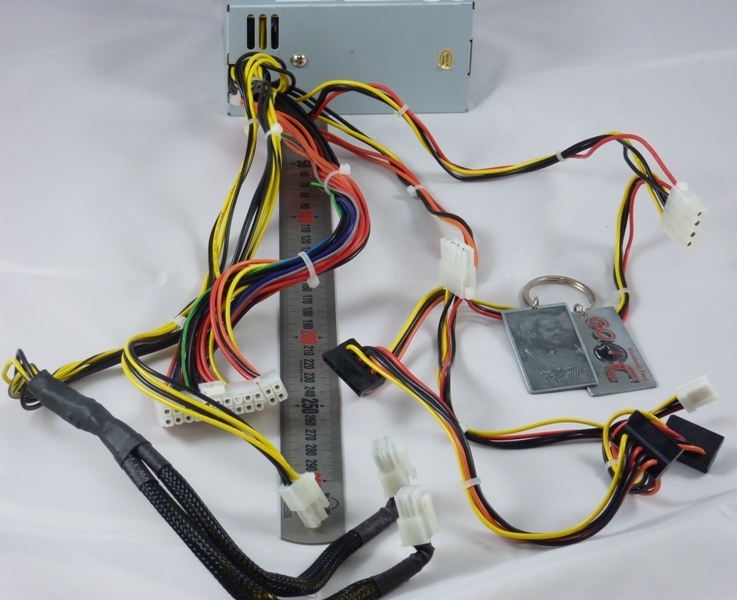 This is a very serious concern for a SFF build because of the space limitations for a power supply. 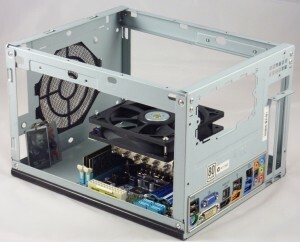 Most SFF cases designed for mini-ITX motherboards either have pico power supplies (with an external brick), or SFX sized units, like the one in the SG05 shown here. 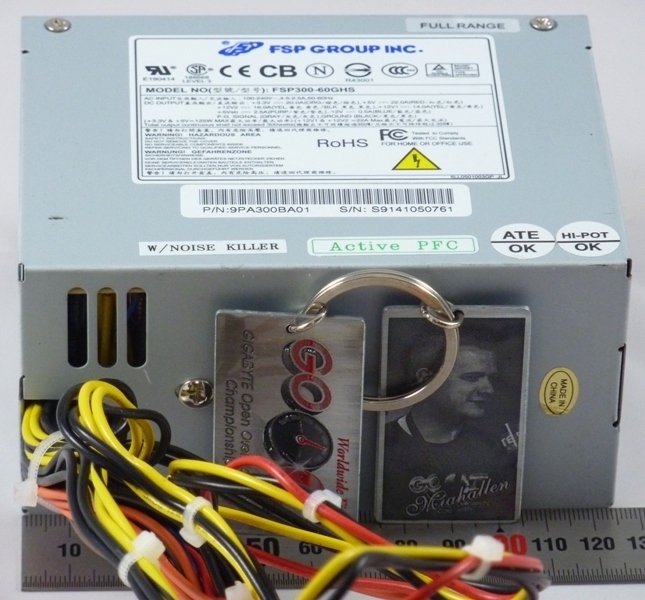 As I mentioned before, Silverstone has selected an 80+ rated 300W PSU made by FSP. 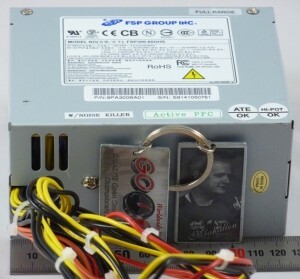 FSP has been pretty generally well regarded over the years, and we’d expect this to be a decent PSU based on the specs. However I’m throwing a lot at it; more than what is recommended by Silverstone. They specifically suggest upgrading to a larger unit in the case of running a 5850 GPU. And I’m pretty sure they’re also assuming a system running at stock speeds so I’ll really be putting this thing through it’s paces. I started by measuring power consumption at 100% stock settings. First idle, then with CPU only, then stressing the CPU and GPU simultaniously. 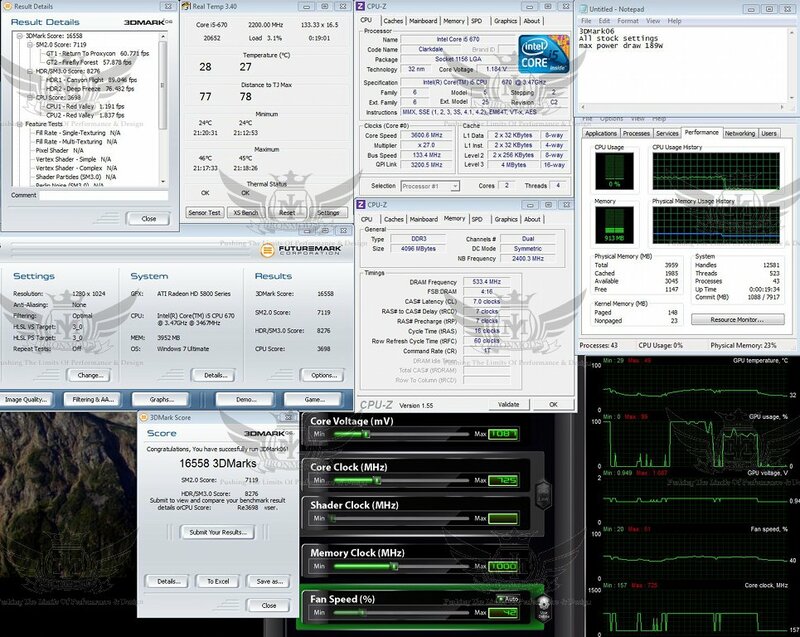 I did this with LinX set for 3 threads, and FurMark at the same time (if you set LinX to 4 threads, there isn’t any CPU power left to run Furmark, and the GPU is not pushed to the max). Then I restarted and applied my final OC’ed settings for the CPU and GPU, and repeated the testing with idle, CPU only, and CPU + GPU stress testing. Stock runs on the left, OC’ed runs on the right. Idle power consumption. 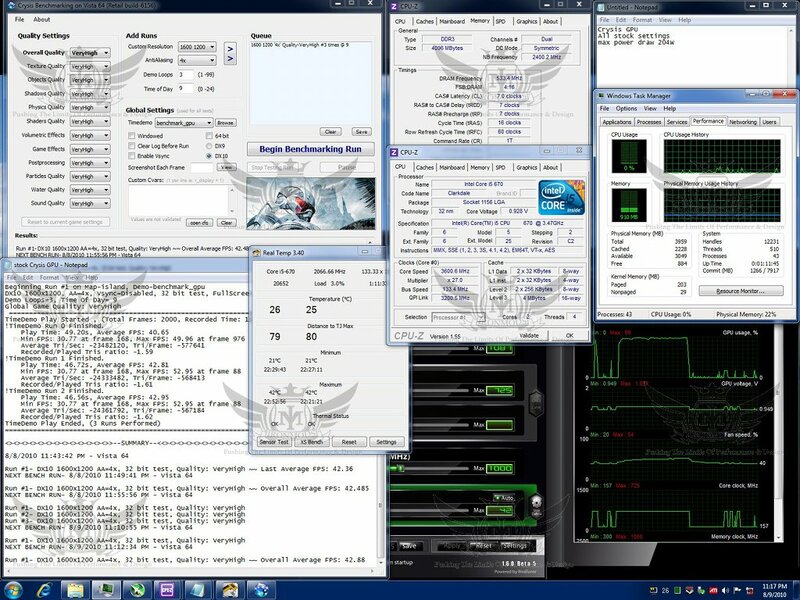 As you can see, idle power consumption was 75W with the system at default clock speeds, and 114W with my OC’ed settings. CPU load only. 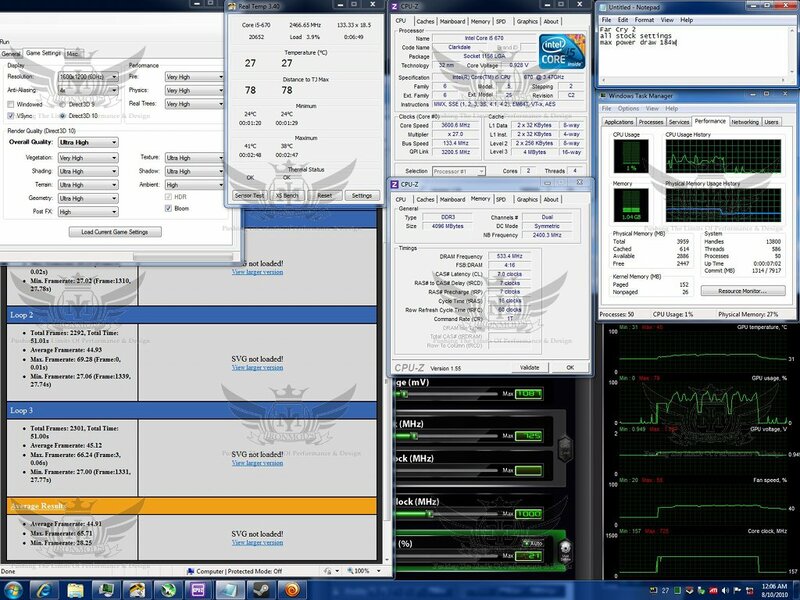 Here, the stock system was pulling 133W max, and OC’ed it was pulling 194W max. 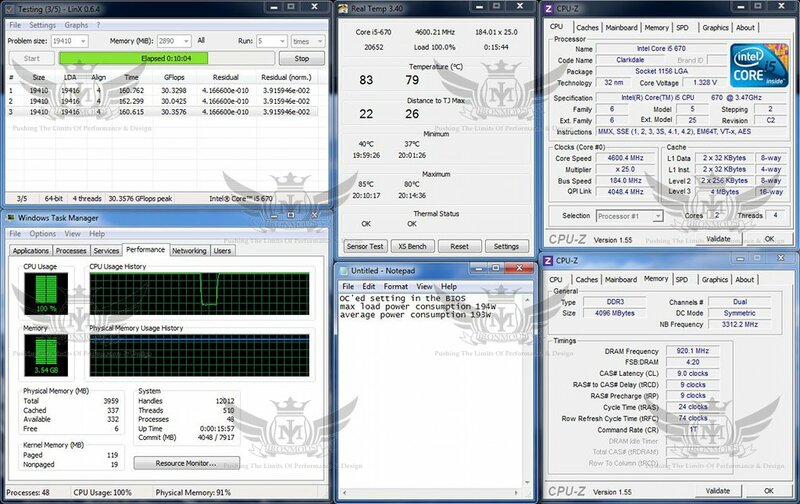 CPU + GPU load. Here, I ran three threads in LinX in order to load three virtual cores, but left the forth to process the GPU load with FurMark. If you perform this test with 4 threads in LinX, you’ll notice that the GPU load is not maxed out. 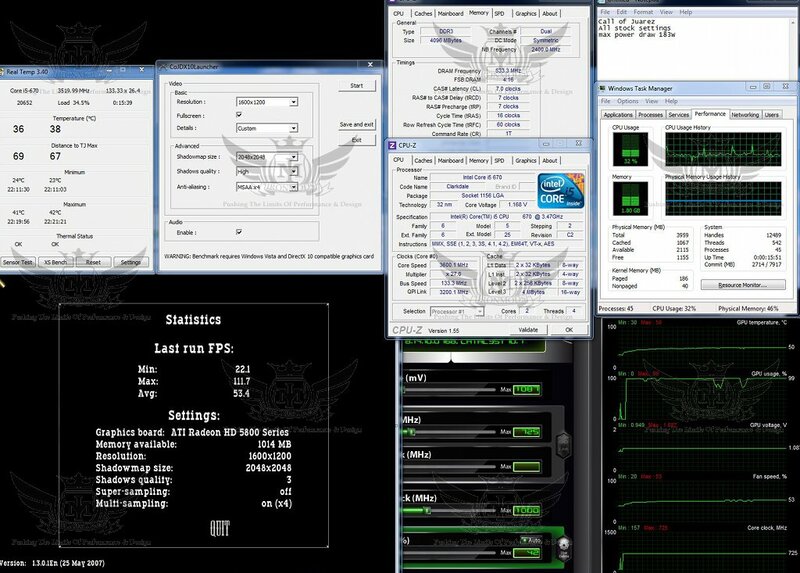 Here I was drawing 272W max with the stock system, and 373W max with the OC’ed system. This was really getting close to the limits of the power supply, so I only ran it for a few minutes. But despite this, I was quite impressed! 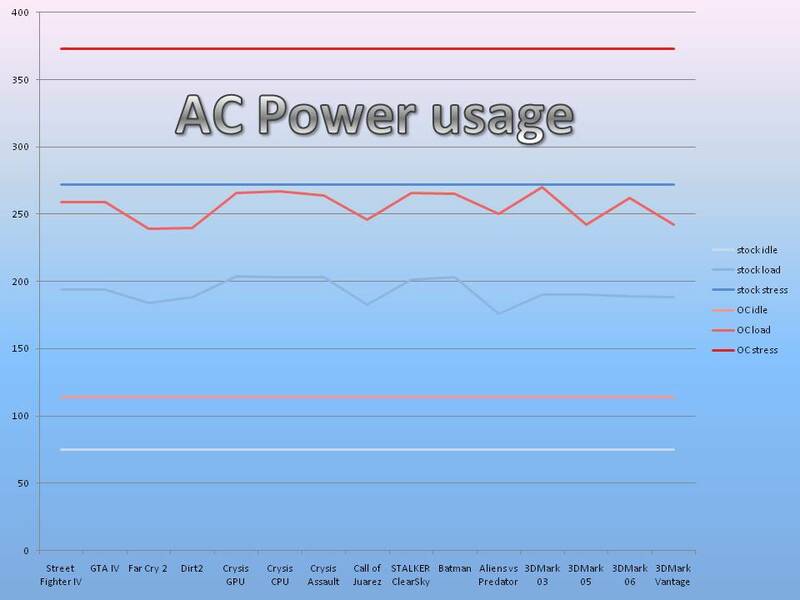 *I also would like to point out that while the PSU is rated at 300W DC output, when I am monitoring the wattage with my Kill A Watt meter, I am monitoring the AC input power. 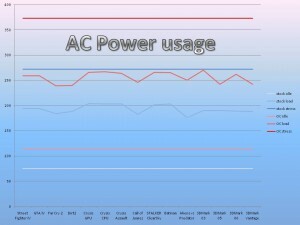 In between the AC input and the DC output….the power is going through a conversion that is not free, the conversion consumes some of the input power (which generates heat)….exactly how much is lost during the conversion depends on many things….but basically, the 80+ rating on this PSU indicates that it is pretty efficient, but at max load it’ll probably consume more than 20%. But for safety, we should assume that it is 80% efficient at full load…that means if the system is drawing 300W, I would see 375W displayed on the Kill A Watt meter (300/0.8). So, by my calculation, any more than that 375W on the display for a sustained period of time should raise red flags for me. 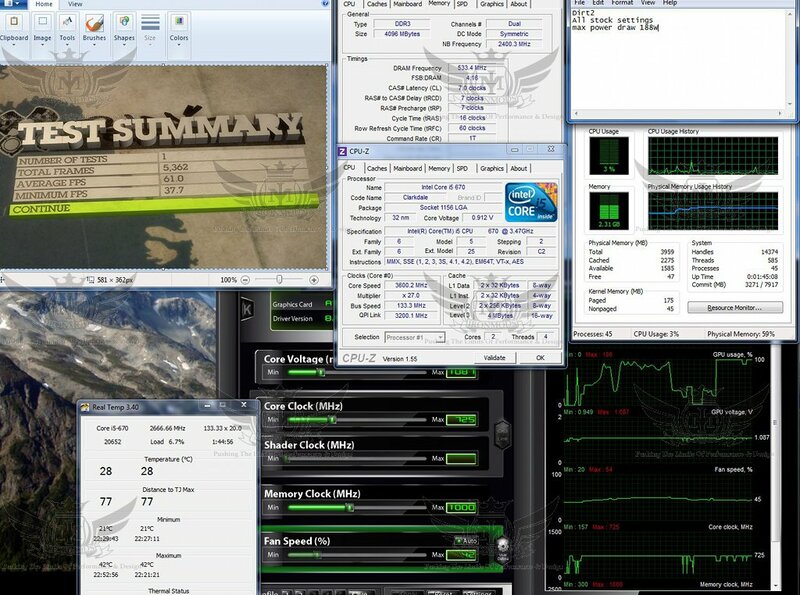 In addition to the stress testing shown above, I kept an eye on the power meter during each benchmark run shown below, and annotated the maximum wattage that I observed during each. I also rebuilt my HTPC, replacing the Zotac motherboard with the Gigabyte offering. 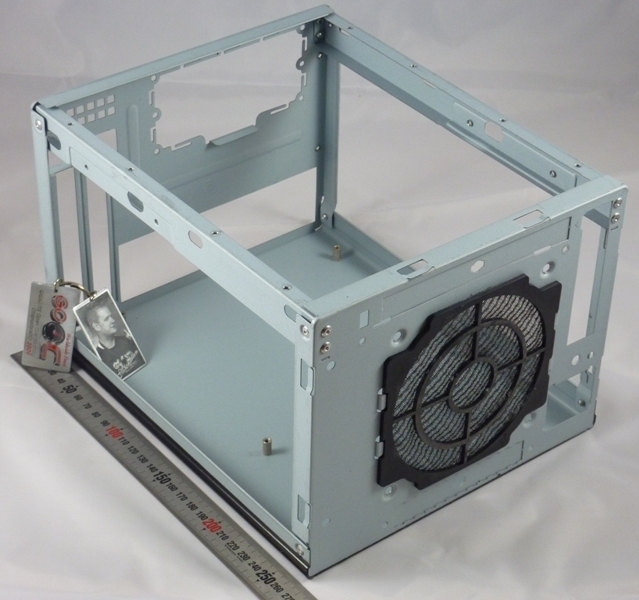 Still housed in the Antec ISK case, the power draw was my biggest concern. 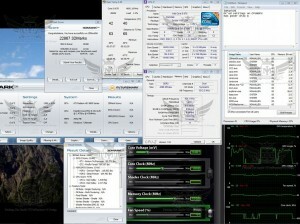 With the Zotac board, I was unable to undervolt and underclock the system and retain stability. 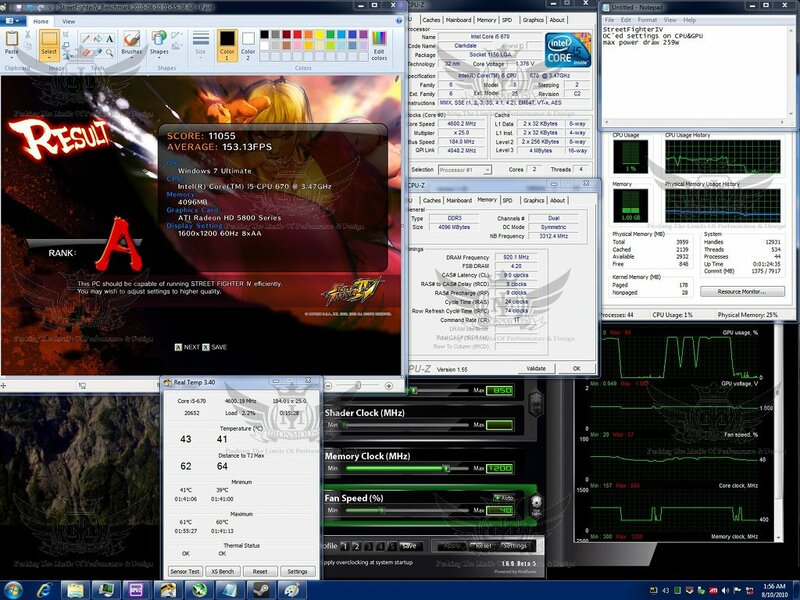 However, with the Gigabyte board this was accomplished without any trouble on my very first try. The most rigorous activity this system is used for is watching streaming video via Hulu desktop, and for watching 1080p x.264 video’s through my wireless N home network. With the Gigabyte board installed, I had to revert to a USB wi-fi dongle….a small price to pay for a low power, low noise, STABLE system. The system is configured as follows. I tested both boards at stock settings and they were virtually identical in power consumption. Again, measured at the wall both system’s idled at about 45W. While streaming a HQ show via Hulu desktop I saw draw as high as 73W. Streaming 1080p x.264 content via my wireless network the power draw peaked at 62W. 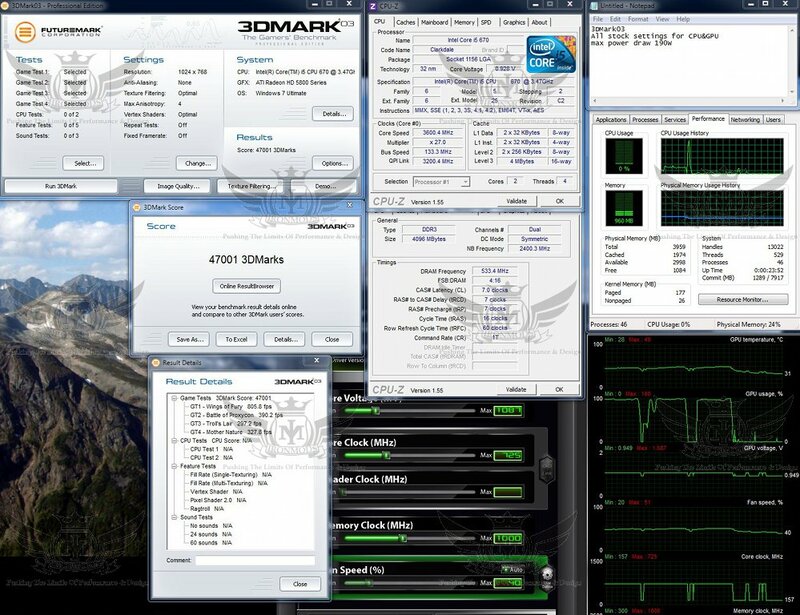 After installing the Gigabyte motherboard I underclocked the CPU to 2.66GHz by lowering the multiplier to x20. Then I undervolted the CPU to 1.0V, the iGPU to 1.0V, the VTT to 1.0V, the PCH to 1.0V, and the vDIMM to 1.5V….the result? Idle power consumption dropped to 40W, Hulu playback dropped to 65W, and the 1080p stream only needed 58W to run properly. I’m actually very impressed by the performance per watt here and I personally don’t think the ION platform has anything on this. My conclusion? YES! It is possible, mini-ITX has come a long way since its humble beginnings and it has now reached the point where it is a viable platform for a powerful gaming machine. It’s amazing to me how much power I am able to pack into such a small box. It easily fits in my backpack and only weights a little more than a desktop replacement “laptop”, yet packs a MUCH bigger punch! I look forward to continued growth in this segment over the coming years. This board has performed so far beyond my expectations I would recommend it to anybody…not just somebody on a budget or for a boring office PC…ANYBODY! 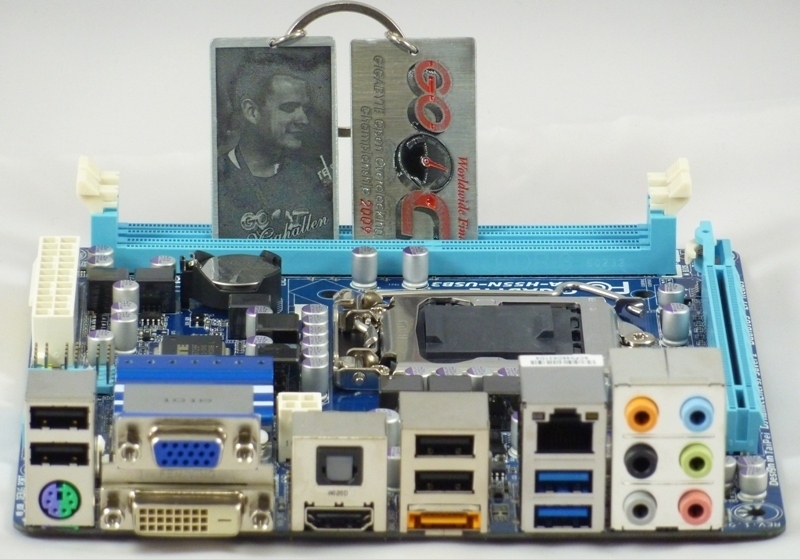 This motherboard is fully featured, stable, polished, and the BIOS is far more mature than you’d expect. It feels very similar to the P55A-UD7 top of the line LGA1156 motherboard from the same company and all this for a very agreeable price. 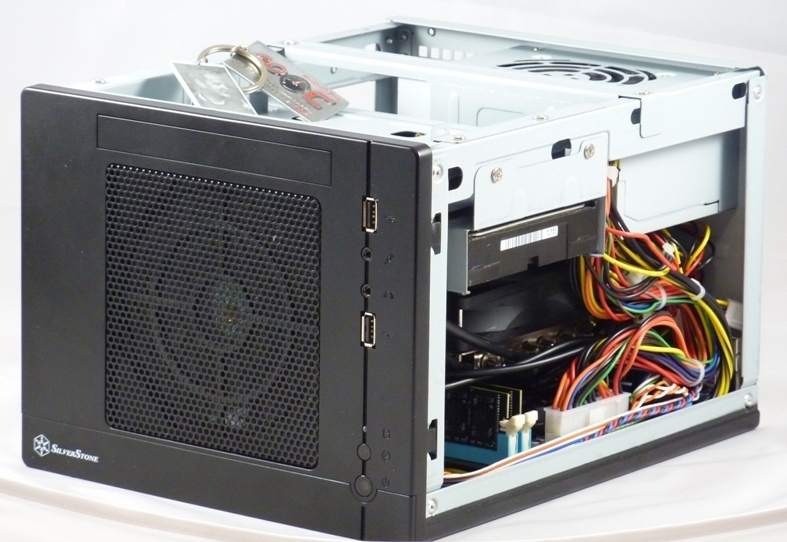 If you want a small PC don’t look any further! I don’t hand out awards in my review, but if I did, this would be a Platinum! 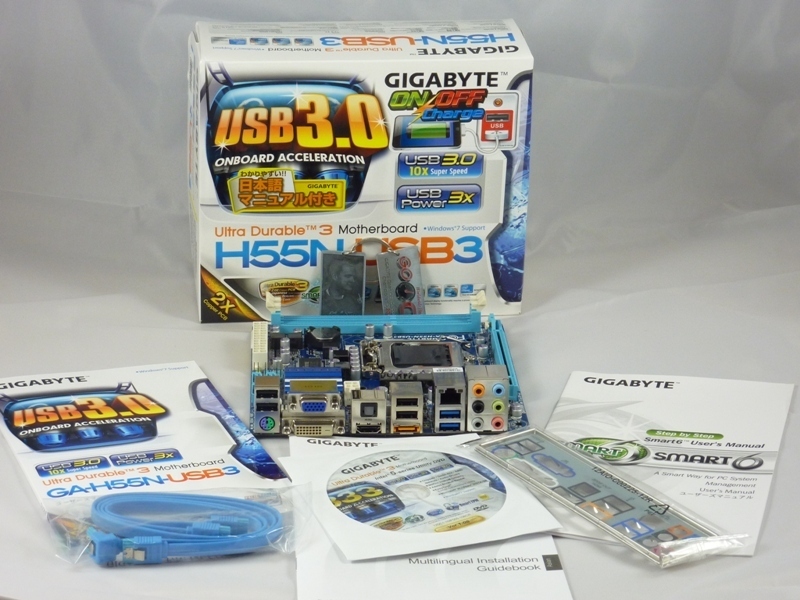 Thank you Gigabyte for providing the two H55N-USB3 motherboards used in this review! 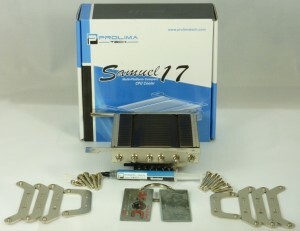 When I first started this build the Samuel 17 was not yet announced. I started by using the Intel stock HSF, and was really frustrated by the lack of decent options available at the time. When Prolimatech sent me the press release for this cooler I was ecstatic and couldn’t wait to try it. I am impressed with its performance and considering the size I feel like they did a very good job with it. I also have some experience with the Scythe Big Shuriken which would be the other major player in this size category. I tested it a bit on my first mini-ITX board with the Core 2 Duo E8400 and honestly I was not impressed. Since I have not compared the two coolers side by side I cannot tell you which one is better, but I do have a lot of faith in the testing methodology of SPCR, and they said it’s better. 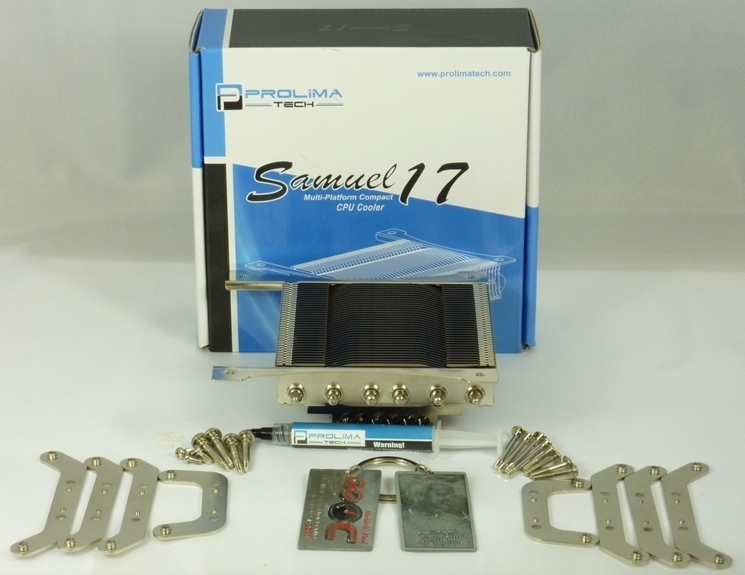 So Prolimatech may want to look at some ways to improve the Samuel 17 to match or better the Shuriken. If they do, I’ll try to get the pair for comparison. 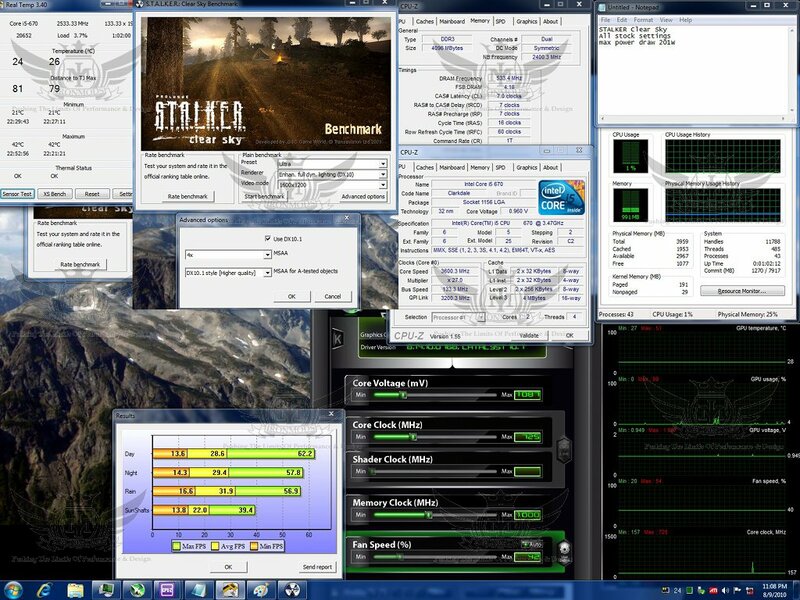 Until then what I can tell you is that the Samuel 17 didn’t dissapoint in my testing and I am very satisfied with my stable 4.6GHz overclock. Something I couldn’t even come close to with the stock Intel cooler. 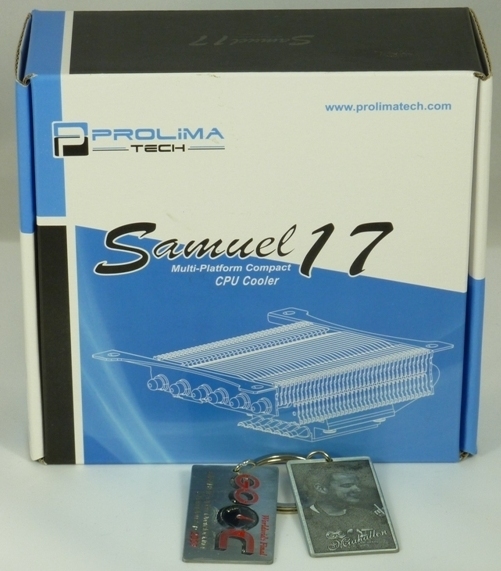 Thank you Prolimatech for providing the Samuel 17 cooler used in this review! 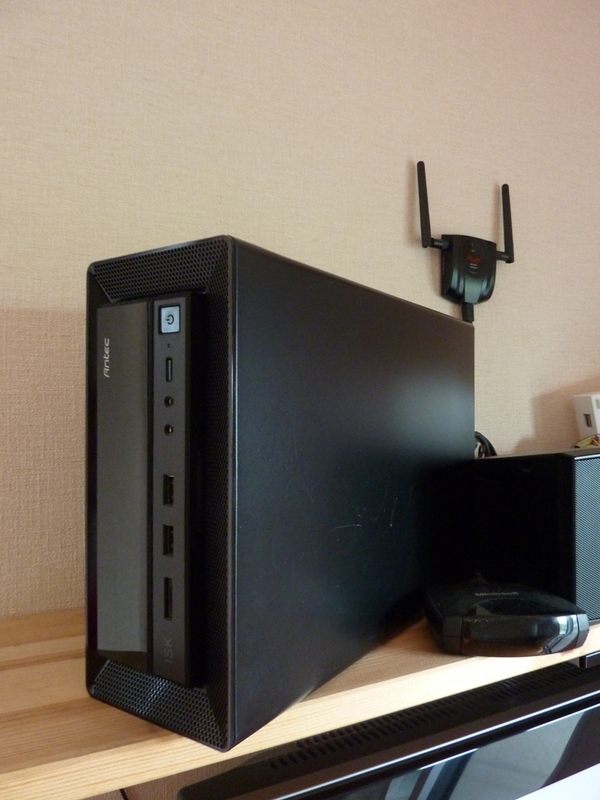 Silverstone did not provide the case used in this review, I bought it second hand, off the shelf from a local store here in Japan. However, it’s combination of size, features, and performance deserve recognition. So, I wanted to make sure I mentioned it in my conclusion. It’s a very impressive piece, and does great things for this emerging SFF market. I’ve seen tons of new designs popping up, but the majority of them are too small, or too large. 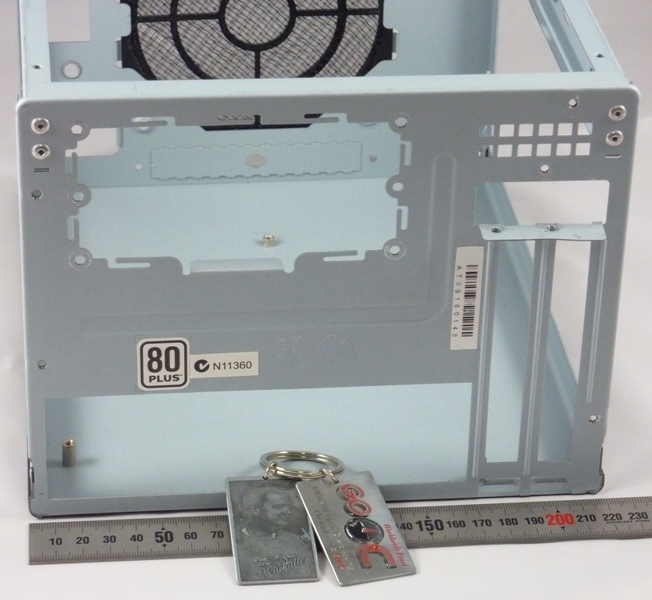 Take for instance the new Lian Li PC-Q08 looks like a great new addition to the segment….but don’t be fooled, by comparison IT’S HUGE! Almost twice as big as the SG05 I used. On top of that, it costs more and does not include a PSU. Well done Silverstone, I’m looking forward to more cool products from you! 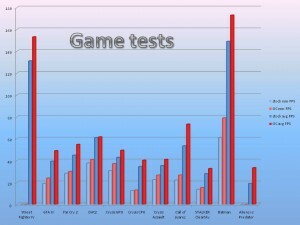 Below you’ll find the screen shots from each of the gaming tests performed. Stock clocks on the left and OC’ed results on the right. 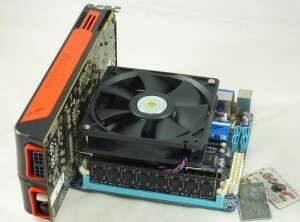 Another computing community I help moderate is owned by craig brugger and is specialized for small form factor computer builds. Sorry, not really spamming but it seems kind of spammy. i have always wanted a sweet little rig like that! awesome build! Either way, excellent write up. I've always wanted a powerhouse mini ITX build. This article just makes me want one more. 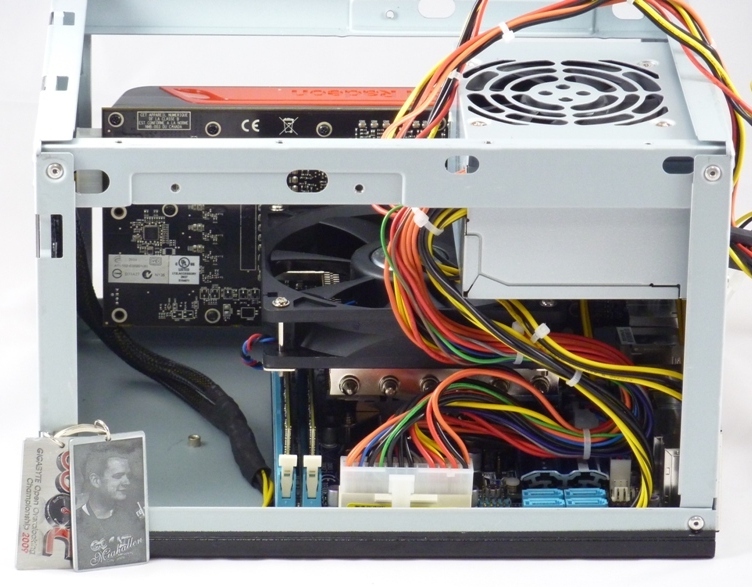 Is there a powerhouse mini ITX club? Great read MIAH! The hits keep coming! 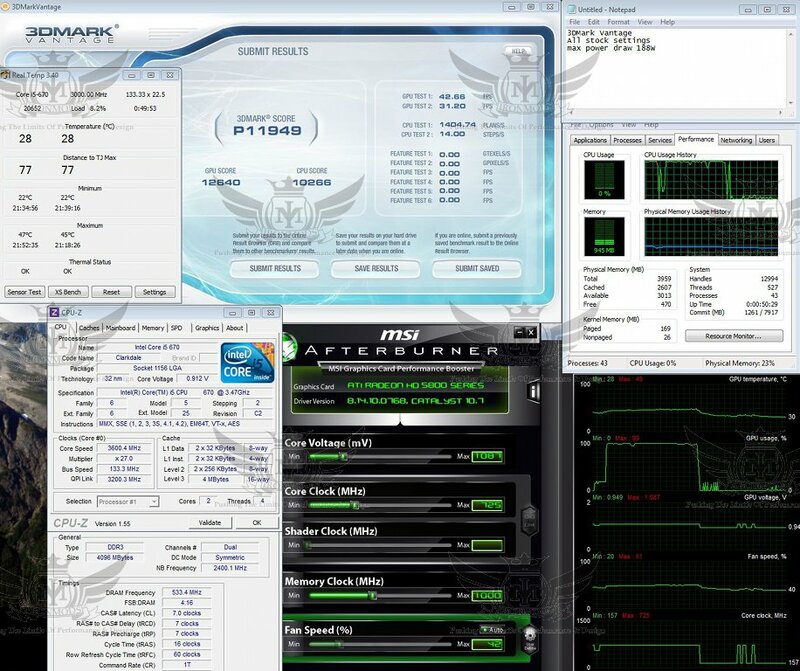 Great read, I'm really impressed with Gigabyte for offering such a great board with a good bios at a decent price. Nope, there's a curve. Efficiency goes up to a point (around 50% or so) then goes back down. I'm planning to rebuild this with some proper modding in the next few months to turn it into the ultimate mini-ITX rig....what do you guys think of the following upgrades? Intel i5 750 CPU - Which I'd hope to run at 4.2GHz or more, plus it has a good IMC and 4 real cores. I'm not going to pursue an i7 because I'd turn off HT anyhow. 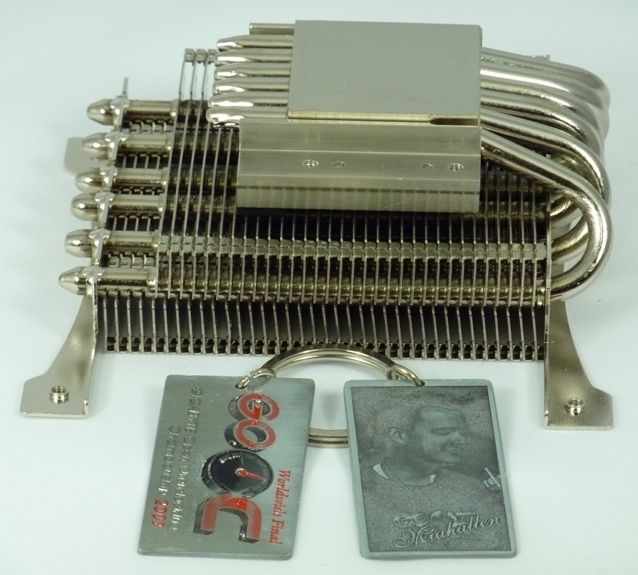 Corsair H70 CPU cooler - all internal. I'll have to replace the 3.5" HDD with a 2.5" and then relocate both it and the SSD. Corsair Dominator GTX3 memory - rated at DDR3-2400 9-11-9-27, but I'll probably try to run DDR3-2000 CAS6 or DDR3-2200 CAS7. 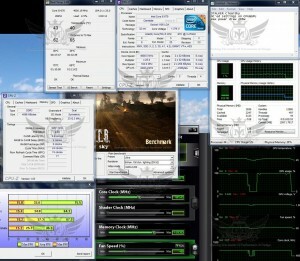 Gigabyte Radeon HD 5870 SOC - stock clocks of 950 core and 1250 memory should give a noticable boost in GPU limited games. I'll have to mod the case a little for this to fit. 500GB Momentus XT - to replace the 1TB Green drive I'm running now. And last but not least, I think I'd be pushing this 300W PSU a bit too hard, so I'll plan on upgrading to the new 450W SFX unit by Silverstone. This makes me hungry for tiny megahertz! 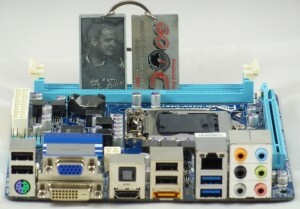 Thats the same motherboard I plan on using for my parent's next computer build. 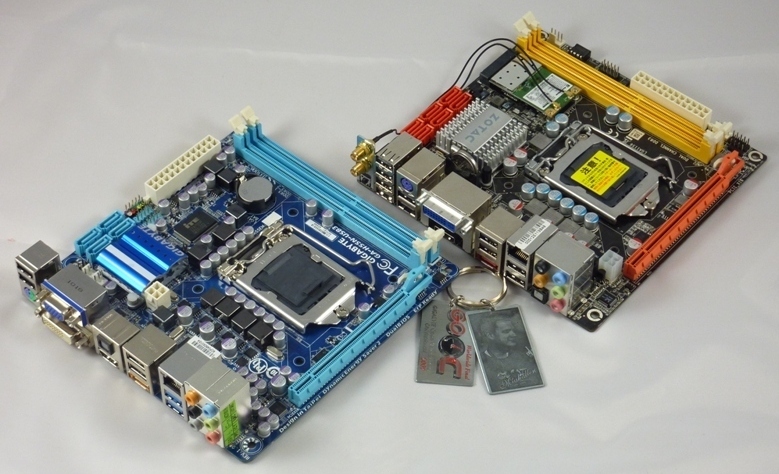 They don't need a full-size board and large case, but common parts are a must.